Regular followers of this series will be aware we started our look at the Brighton Main Line by working our way down from London. Until now we we have been looking at what have turned out to be relatively minor problems holding back capacity improvement on the Brighton Main Line. When we get to the vicinity of East Croydon, however, it all changes and we really get to the heart of the issue of capacity on the line. When thinking of places with very high numbers of daily train movements one naturally thinks of Clapham Junction. East Croydon may not match that but it is very busy and, unlike most services serving Clapham Junction, there is a lot of complexity as trains get sorted out in order to be routed to their ultimate destination. A carefully chosen selection of locations showing daily train movements. In an attempt to drive home the point about how busy East Croydon and Windmill Bridge Junction are, the recently published draft Sussex Route Study contains a chart showing the number of daily train movements at various locations. Network Rail clearly chose to omit one or two of the busier locations of the former Southern Region but nevertheless it does show East Croydon and Windmill Bridge Junction (which it defines as “the junction north of East Croydon where the lines to London Victoria and London Bridge diverge”) being significantly bigger than various well known iconic places. Possibly the most relevant is Reading where the whole complex, recently rebuilt to eliminate the worst pinch point on Great Western, only has two thirds the daily train movements that Windmill Bridge Junction has. It is hard to overstate the importance of the proposed work at East Croydon that is currently scheduled to take place around 2022-2023. The situation can be starkly stated as follows: if you don’t sort out East Croydon there is really no point at looking at any of the other major planned schemes for the Brighton Main Line. We will qualify this just a bit in a moment but the absolute need to sort out East Croydon is a basic premise that is guiding Network Rail’s thinking. For trains coming up from Brighton, East Croydon is the final station before the route diverges to Victoria and London Bridge. Furthermore, it is also effectively the station where everything from all the branch lines to the south finally comes together. South Croydon could possibly make a similar claim, but ultimately there the fast and the slow lines are quite separate. It follows from the previous paragraph that anything that affects the railway between Windmill Bridge Junction and South Croydon can have a potentially paralysing effect on the entire Brighton Main Line service. This isn’t just a hypothesis. For a good account of one occasion when this actually happened read pages 8-10 of the October 2011 issue of Rail Engineer. On that occasion the disruption was due to a water main leak. Indeed what this article didn’t really highlight was that it was not just the railway that was affected – there were other knock on effects as well. For if the railway doesn’t function then everyone takes to the roads to get to Gatwick and this tips the road traffic level up to the point where the result is huge congestion in outer South London. Even when things are running normally East Croydon remains very much a critical pinch point and the obvious desire for the future is that it should no longer remain so. With this in mind Network Rail have already carried out a lot of mitigation work to try and ensure that a single point of failure does not, wherever possible, knock out both the fast and slow lines through this critical section of railway. This belief that East Croydon is the main problem around which everything revolves is also backed up by the last London & South East Route Utilisation Study. We reported at the time that the study seemed rather defeatist. It suggested that there was no short or medium term solution for the East Croydon problem and placed its long term hopes on approval for a tunnel from south of Purley right the way to central London through which relief tracks could run. Clearly this would be many decades away and with rapidly rising passenger numbers some people in Network Rail must have realised there was no conceivable way they could wait for a tunnel that might never come. We have seen in part 4 that some improvement in capacity can be made at Victoria relatively easily. We have also seen in part 5 that issues at Clapham Junction can be partially solved by letting nature take its course and eventually more modern signalling, ETCS (European Train Control System), will improve matters. If that were not enough to solve Clapham Junction’s capacity issues on the Brighton Main Line fast lines then there are other things that can be done, although quite major work would be involved. In part 6 we have seen that at London Bridge it is not the terminal platforms that will be the constraint. So with a couple of minor exceptions, and rather like a wonder cure, Network Rail is taking the attitude that whatever the problem with the Brighton Main Line, the first part of the solution is to sort out East Croydon. The exceptions mainly centre around Redhill. There are a few local problems that can be cured with an extra platform (platform 0) at Redhill that should be operational by 2017. This will also allow improvements to the Reading – Gatwick service which of course does not go anywhere near East Croydon. Nearby, a proposed new terminating platform at Reigate will at the very least give more operational flexibility regardless of what happens at East Croydon. So far we have been very lax with our terminology and have bundled an awful lot of things together and called them “the East Croydon problem”. We really need to be more specific and clearer. The problem really is one of trains calling at East Croydon and passing through various junctions just north of East Croydon where the line splits to Victoria and London Bridge. The most critical of these junctions is one mentioned earlier – Windmill Bridge – but references to Windmill Bridge often really refer to the whole set of junctions. The larger area is sometimes referred to as the Gloucester Road triangle. As always Carto Metro assists in identifying the location and the surrounding area, but on this occasion it really cannot do justice to the complexity of the layout. The area has long been associated with transport but originally it was the Croydon Canal that was dominant. References to specific locations north of East Croydon may well have come from that era but are not helped by referring to locations that no longer exist. Windmill Bridge itself falls into this category. One would have thought identifying the location of a former windmill would be easy enough but there were in fact four windmills in the vicinity according to a local history archive. It is even more unclear as to what bridge was originally being referred to but the current bridge taking the main road over the railway tracks is known as Windmill Bridge and has been for around 150 years. 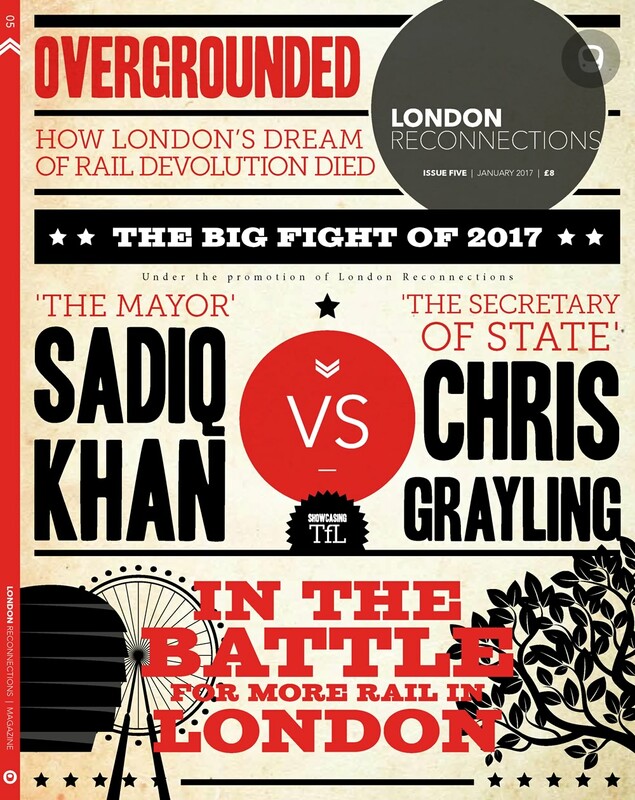 We also have to be aware that whilst the focus is on East Croydon there is also the issue of trains that serve West Croydon which, of course, include London Overground services. Most trains from West Croydon are all-stations to either London Bridge or Victoria. There are a few fast trains, however, to and from London Bridge in the peak hours so the track layout also has to cater for these. Historically East Croydon was not a big problem. In the very early days steam trains used to come up from the coast and divide at East Croydon with one portion going to Victoria and another to London Bridge. Quite remarkably, the whole area was semaphore signalled until 1954. Southern Railway had four aspect signalling installed in the critical inner London areas in the 1920s and the company was very aware of the benefits of four aspect colour light signalling schemes covering critical junctions. It is surprising therefore that the East Croydon area was not tackled sooner and that it was not already signalled with four aspect signalling before the Second World War broke out. In 1983 there was a major resignalling scheme involving substantial track modifications. With an increase in long distance traffic from Surrey and Sussex and a generally declining suburban demand it made sense to sort out the issue of the fast lines. On the London Bridge side the fast lines were (and still are) the centre two of the four tracks. With the platform layout at stations between Norwood Junction and New Cross Gate as they were there was virtually nothing that could be done there even if one wanted to. With the Victoria fast lines being the two westernmost tracks from Selhurst to Victoria it made a lot of sense if the westernmost tracks at East Croydon were also fast lines. Until 1983 this was not the case. The 1983 (current) layout. Changes are shown in red. Until the 1983 resignalling the western most tracks at East Croydon (platforms 1 and 2) weren’t fast lines – they were the slow lines. In a manner reminiscent of the London Bridge scheme of 1976, the 1983 scheme meant that trains on their inward journey would be largely sorted much further out into slows and fasts. This would have been done by Stoats Nest Junction which is just north of Coulsdon. In fact prior to 1983 this was already happening but the lines then crossed again north of East Croydon largely undoing the good work of separation that had already been done. What happened in October 1983 was that the fast and slow lines were swapped between Stoats Nest Junction and the Gloucester Road triangle. At East Croydon the separation of services would be complicated somewhat by trains that were regarded as slow trains south of East Croydon but fast trains north thereof. This is still the situation today. In simple terms a slow train, or at least a train occupying the slow tracks, south of East Croydon today will either start or terminate at South Croydon or call at either Oxted or Purley. The 1983 resignalling scheme was a big logical improvement and was probably the right scheme for the time but, inevitably, the need for more capacity, in part brought about by other improvements, means that it is no longer particularly suited to today’s needs let alone in future years when the Thameslink Programme is complete. Some of the problems are ones that can be found in many places on the railway already and are partly explained by growth in passenger numbers. East Croydon station has the issue of dwell time, and hence platform occupation time, which has increased over the years. 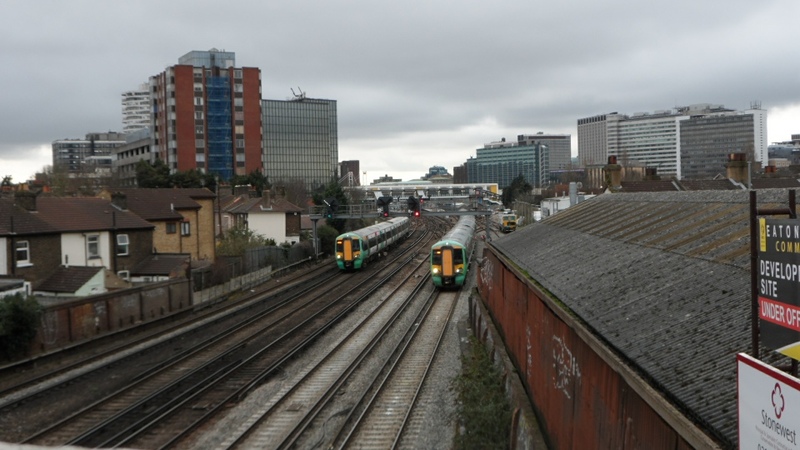 Longer trains mean more of an issue with signal overlaps made worse by the short distance between East Croydon platforms and the Gloucester Road triangle. In the meantime signalling standards have imposed more restrictions on what can be achieved by improved signalling using the current track layout. The track layout around East Croydon has some particular issues. Two particular problems concern trains in the up direction that occupy the fast tracks all the way from south of East Croydon to London or vice versa. The reversible fast line is rather limited in capacity when used in both directions which it generally is. Using it in both directions also means that one cannot plan moves in one direction without taking into account any consequences this might have for trains travelling in the opposite direction. Obviously an extra line would potentially allow complete segregation. This would mean in a northbound direction a following train would not have to wait for the previous train to clear the platform before being able to enter the station. In the southbound direction trains from London Bridge and Victoria could enter East Croydon station simultaneously – as they sometimes do now. The junction where the fast trains to and from the south split to go to Victoria or London Bridge, Windmill Bridge Junction, is currently a flat junction. Actually it best considered as two flat junctions – one for the fast lines and one for the slow. These flat junctions inevitably lead to issues of capacity and the knock-on effects of a train arriving late. Possibly the worst problem of all relates to the trains that serve the slow lines south of East Croydon (platforms 4, 5 and 6) but are fast north of East Croydon. There are a number of problems associated with these services which are basically the Horsham starters, the Oxted Line trains and the Caterham and Tattenham Corner trains that are fast from East Croydon. In the case of the “Cats and Tats” there is a big incentive to combine these at Purley to reduce the number of these trains. The first real problem is that platforms 5 and 6 form an island at East Croydon. This means that, to avoid making things too awkward for passengers, it would be much simpler if platform 4 could be designated the up platform and platform 5 only used for down trains and the occasional terminator despite being notionally the slow reversible. Having just one up platform for the peak period slow trains at a station as busy as East Croydon is quite a restriction. Changing from slow to fast train at East Croydon is bad for all Victoria services because the only way to get to the fast lines to Victoria is by occupying the slow lines just south of Selhurst, albeit briefly, in the process of doing so. The junction is entirely flat so this is quite a restricting move. The previously described awkward way of getting from platform 4 to the fast up Victoria line can be circumvented by simply crossing on the flat just north of East Croydon station. Indeed, in the off-peak, if a signaller spots an opportunity to do this in the up direction, especially if the train is late, he may well do so and thereby knock a minute or two off the journey time. A further problem is encountered in the up direction when a slow train at East Croydon proceeds to the fast line to London Bridge. It has to cross the down Victoria slow at Cottage Junction and then it has to occupy the slow line to London Bridge before swapping over to the fast by the time it gets to Norwood Junction. Looking at the slow trains arriving at East Croydon is not especially relevant to Sussex issues but one has to remember that, according to our definition at the start, the trains that start at East Grinstead, Uckfield and Horsham (all in Sussex) run on the slow lines on their approach to East Croydon from the south. Whilst the number of fast trains serving East Croydon is reasonable and the number of slow trains from Sussex that run fast from East Croydon northward could be described as adequate, the remaining number of slow trains (the all stations trains) is really very low considering. To make matters worse one of “slow train” services is the direct service to Milton Keynes which doesn’t serve central London and is really only a slow service (as far as Clapham Junction) because there is no realistic way to run it fast to Clapham Junction. The paucity of slow services is not through lack of demand but simply because of the conflict between fast and slow services. So, currently, the only way to increase the number of slow all-stations services is to cut down on the number of fast services – or at least services that are fast north of East Croydon. So provision of fast and slow services are related and any solution to the East Croydon problem – even if only intending to improve the fast services – needs to look at both the fast and slow services. A further consideration when looking at a suitable service to be provided in the area is to recognise that Croydon will attract a lot of people travelling to East Croydon in the morning. Currently there is a lot of redevelopment going on and that and the future shopping redevelopment – with all the extra jobs this will bring – will only add to that. On top of that, East Croydon is, of course, an obvious place to change at when making longer journeys e.g. to Gatwick Airport. It is surprising how many stations not very far away (e.g. West Norwood, Crystal Palace) do not have a direct service to East Croydon in peak hours. Even somewhere like Forest Hill has only a very limited half-hourly service to East Croydon in the peak period. Of course for many of these stations there is a service to West Croydon which will be an acceptable alternative for many. Nevertheless there are clearly many services that could be provided (and in some cases were provided in the past) if only the capacity were there. In practice this new island platform (1 & 2) would have to be located on the west side of the station very slightly further north than the existing platforms to enable the necessary tracks to pass under the road and tram overbridge that is outside the main entrance to East Croydon station. Such a platform arrangement as listed above would more or less solve the dwell time issue as the two up fast platforms (1 & 2) would both serve the single up fast line from the south. Similarly the down fast platforms (3 & 4) would serve the single down fast line to the south. On the eastern (slow) side it would be more complicated with the four platforms (5 – 8) at East Croydon serving the slow lines to South Croydon of which there are three. It would resolve the current issue of only, effectively, having one up slow platform as in future both platforms 5 and 6 (currently numbered 3 & 4) would serve the up slow (and reversible slow in the up direction). Both the existing and the future track layout at East Croydon requires getting one’s head around, but in essence it involves replacing the flat junction where the down fast Victoria and the up fast London Bridge have to cross with a new grade-separated junction and a new flyover (London Bridge fast flyover) so that the fast lines are completely separated from the other lines. Network Rail’s proposed solution for implementation in CP6. What follows from the above is a clever bit of reuse. There is currently grade separation in the vicinity of Cottage Junction which was built in 1983 to enable the slow lines to Victoria and the up slow to London Bridge to pass over the fast lines to and from London Bridge (which of course are to and from the current platforms 1 – 3). This will then be partially reused to provide grade separation for the slow lines. Sadly one thing the proposed scheme really does not address is the issue of trains on the slow side of East Croydon (future platforms 5 – 8) travelling fast to and from Victoria. These will still have to effectively switch between the slow and the fast lines just south of Selhurst station. It is hard to see how this can be avoided. What it probably does mean is that in future there will be a reluctance to provide any service fast from East Croydon to Victoria beyond the minimum necessary that calls at Purley or originates from (or terminates at) East Grinstead or Uckfield. The latter is not a problem because Uckfield trains, which are diesel, do not normally run to Victoria. Passengers on the East Grinstead, Caterham and Tattenham Corner lines will probably encounter extreme resistance to running more fast trains to Victoria should they press for it. Purley passengers will probably welcome the new journey opportunities that Thameslink will provide but also find a deteriorating service of fast trains to Victoria. The other limitation of the revised scheme is that there only two tracks on the slow lines north of East Croydon – as far as Windmill Bridge Junction. This would appear to be unavoidable but a pity. At least in future if a Victoria down slow train was brought to a stand at Windmill Bridge Junction it would not be affecting other services. One thing that further complicates the scheme for enhancing East Croydon is the need for land take. This is not for the station itself where Network Rail has at least safeguarded its own land so that with a bit of adjustment it can fit the necessary eight platforms in – more about this in a future article – but for other elements of the new layout. Land take can greatly complicate a project even if the amount taken is tiny. This is especially true if residential property is involved. Of course if you can simply buy the land that makes life much easier. The 1983 scheme required land but as this was owned by Croydon Council, who was willing to sell, this was not an issue. Network Rail has not said what land needs to be taken but knowledge of the area would suggest that a number of houses in a row of old railway terraced cottages in Gloucester Road may be needed. Assuming that this is correct, whether these could be purchased by agreement and how many would actually need to be demolished (as opposed to have part of their garden taken) is unknown. Of course if compulsory purchase were necessary that may trigger a public inquiry which would have to be factored into the timescale. It is not only the railway cottages that may need to be subsumed to provide land necessary for the desired layout. There are also some very low grade industrial outlets just to the west of the track northwards from East Croydon and it is expected that some of that will need to be made available for any new scheme. On top of that an aerial view shows that an additional arch needs to be created or opened up in Windmill Bridge (a road overbridge) itself and this in turn may well necessitate a small diversion of Gloucester Road away from the railway cutting. A view from the current Windmill Bridge (Lower Addiscombe Road) looking north towards Windmill Bridge Junction. The above picture is taken from the bridge by the junction of Addiscombe Road and Gloucester Road. On the other side of the parapet to the left is Gloucester Road. Windmill Bridge Junction on the fast lines (the three leftmost lines) can be clearly seen protected by signals. Under NR proposals there would be a fourth fast line to the left of the existing tracks. A view from the current Windmill Bridge looking south towards East Croydon. The above picture is taken from the other side of the road. The new platform would be to the right of the picture and an new track will be added the right of the existing tracks. The demolition of the building in the foreground would seem inevitable. If one were to assume that the road overbridge were to remain without being rebuilt then the track would have to be slightly further to the east (right) in order to line up with an existing bricked up arch. More Overground to West Croydon? It makes sense while looking at East Croydon to look at a proposed enhancement suggested by TfL which is intended to make it possible to increase the London Overground service to West Croydon from 4tph to 6tph. The exact track layout shown to achieve this is a bit speculative but it is based on official comments made. We are looking at it as if it were a separate scheme but in reality, if it were implemented, it is believed that this would be done at the same time as the rest of the East Croydon work in order to further recapitalise on resignalling that would need to be done anyway. An educated guess at TfL’s proposed enhancement to enable extra LO trains to terminate at West Croydon. We do know a few useful facts which means that this scheme appears to fit in with future Overground plans. We know there is a strong desire to increase services northbound London Overground from Sydenham by 2tph in the morning peak as “pixie busters”. We also know that these will initially originate from Crystal Palace even though West Croydon is preferred. This is because there is not the capacity at West Croydon so the idea of increasing the capacity of West Croydon for London Overground trains makes sense. We also know that the 2050 Transport Supplement appendix suggests that the East London Line core should be upgraded to automatic train operation of a type known as ERTMS which is the same type as will be implemented on the Thameslink core. This would happen around 2023 which neatly fits in with the West Croydon enhancements. This may well suggest 6tph to both West Croydon and Crystal Palace. It would appear that the long term objective may be to run 6tph on each of the four branches south of the core – New Cross, Clapham Junction, Crystal Palace and West Croydon. Although East Croydon is very much a post-Thameslink Programme project, the railways have a long lead time and one suspects that teams in Network Rail are beavering away at working out the costs of the proposed East Croydon upgrade right now. The way the railways currently work is by dividing the future into five year control periods. The next control period is CP6 which runs from 2019 – 2024. The government allocates a certain about of money for each control period depending on the case put forward for relevant schemes. So, to complete the work around 2023 Network Rail need to have the funds awarded to do the job at the start of CP6. To get these funds they need to present their case to the DfT by 2016. In planning terms that is not far away. It would probably not be an exaggeration to say that East Croydon will be the most important location-specific application made for funds in CP6 in the London Area. Seeing as pretty much any proposals for improving the Brighton Main Line rely on the work at East Croydon taking place there is a lot riding on this and it is very important for Network Rail to make a good case. In fact, one aspect of one other really important proposal for CP6 (the digital railway) is probably also highly desirable to improve the Brighton Main Line. As a congested railway the Brighton Main Line would benefit a lot from implementation of the European Train Control System (ETCS) and the overlaid European Railway Train Management System (ERTMS). It follows that the funding available in CP6 and what it is allocated to is going to be of crucial importance to the Brighton Main Line. If all goes to plan it seems that, by the time the Thameslink Programme is complete and fully bedded down, South London commuters will be bracing themselves for another major burst of disruption. Passengers will have to settle for being grateful for their few years of relative peace starting around 2019. This will probably also impact on franchising. If the level of disruption is as great and as impossible to predict as expected, one can see that the largest potential franchise may well revert to a management contract (as it is today) as no private company would be prepared to take the risk without a suitably large financial incentive to do so. The Thameslink Programme had a preliminary project phase called Key Output 0 then two major phases – KO1 and KO2. There was a pause between the two main phases which was largely down to the Olympics. One can argue that the work due to be done at East Croydon is not really Thameslink specific but then Thameslink currently affects far more passengers than those that just use the Thameslink services. Maybe we should think of the work proposed at East Croydon as Thameslink KO3 and brace ourselves for the levels of disruption we have come to associate with Thameslink. At least the developments at East Croydon, if they go ahead, will unlock the potential for significant and much needed capacity increases. In future articles we will look at these potential capacity increases elsewhere. Many thanks to ngh for drawing all the diagrams. The answer is to go to neither. What’s the point? The existing services can still go to those old-fashioned terminating platforms at Victoria and London Bridge. The only sensible idea is a Crossrail, so start the tunnel south of East Croydon, have two platforms in tunnels under East Croydon and then Bond Street (Crossrail 1) … perhaps the out of Marlylebone to take up the Birmingham Moor Street/Snow hill/High Wycombe route. Need a bit of vision, rather than trying to replicate what’s already there, surely? I got the definite impression that the whole point of BML2 was to serve Uckfield. If we can’t do that, we may as well keep our crayons for joining Cheshunt to Chelmsford, or something. That’s the first time I’ve seen that idea. I think it misses out a few of the costs though. 1) Do you not need to double Imberhorne cutting and viaduct? Reworking the cutting and removing more of the spoil heap feels like an expensive job. 2) The work south of Haywards Heath station to Keymer Junction looks non-trivial, having travelled the line many times. 3) I’m sure you are not suggesting that all Lewes traffic goes via East Grinstead, so do you need to grade separate Keymer Junction or Copyhold Junction (or both) to cater for the extra traffic? 4) I’m inferring that you would run third rail electrification from East Grinstead to Copyhold Junction or a number of electric trains become diesel. Adding all this up, and remembering your only journey added is Lewes/Haywards Heath to East Grinstead, it seems to me that Lewes to Uckfield is better value for money. … and I thought that the whole point of this “A Study In Sussex…” series of articles is that the capacity issues are from Central London to East Croydon? As lovely as the idea of re-connecting East Grinstead -> Horstead Keynes -> Haywards Heath is as an idea, it doesn’t address the capacity on the BML. 3) Tunnels for trains are quite expensive, but nothing like the cost of stations for trains in tunnels. 4) There is not such thing as the word “just” when it comes to permanent ways. 5) The capacity of a section of railway line is a function of many things: the length of the train (carriages), the max speed, the acceleration and stopping times. But also the size of the doors and the escalators to the street. Which leads to a proposal for a long tunnel from East Croydon to central London as this will create many new pathways, and then allow the “old rails” to be used for local/stopping services. A line to Brighton from the Sussex countryside… less so. IMHO. Imberhorne Viaduct was double-track before BR closed it in the 60s, so it could most likely still take double track without major surgery. Apart from Imberhorne cutting, there are various other bits of the formation between East Grinstead and Horsted Keynes which are only wide enough for one track, and would need reworking. Between Horsted Keynes and Ardingly, Sheriff Mill Viaduct and an occupation bridge would also need to be reinstated. @mr_jrt – I think the current owners of the East Grinstead to Horsted Keynes line might object to the takeover of their line, particularly after all the effort over the last 10 years to get it reinstated. @Jim Cobb -indeed,they might not sell up at all – particularly for something that doesn’t actually address the problems of BML. If the Bluebell Railway did not wish to sell, there could in theory be a compulsory purchase. However, I think this would produce an enormous public outcry. And it is difficult to see why they might wish to sell, or indeed, whether as a charity they would be allowed to sell for a purpose which, however socially desirable, is outwith what I assume are the aims of their charity. And if they did sell, or were CPO’ed, what could they sensibly do with the money? Buy dozens of further steam locos to use on what would remain of their railway? Depending on the commercial rate they recieve, maybe they could buy a nearby disused trackbed running parallel to their current site and rebuild that to play trains? Lewes-Uckfield by steam anyone? As for the formation, it was all double track originally, any infringements would probably be down to the Bluebell only needing a single line and landowners asking too much for the land. Neither are issues for a TWA project as it would have to be. I suspect the government wouldn’t charge itself landfill tax either, so I doubt Imberhorne would be too much of a constraint. @mr-jrt -I believe the problem with the Brighton Line lies north of the routes you have in mind as discussed extensively on this thread. (There’s zero point in delivering more trains to the Croydon bottleneck, and there’s little point in adding a revived slow route south of there; it may be only a little longer via Lewes but it is longer and certainly not laid out for speed, it also only can relieve the fast trains to Brighton as it travels there by a different route. Slower and longer isn’t a good plan to relieve the Brighton fasts). Isn’t that just the 3 miles bit between Haywards Heath and Wivelsfield, or have I missed something here? If you’ve been reading the articles here… you know it will achieve nothing at all. The capacity issues are to do with the crunch between Central London and East Croydon. It matters not what is going in Sussex – the line had loads of capacity there – the problems are all within the M25. A tunnel from East Croydon to Central London would allow twice as many trains up the rest of the BML, at least! So heritage railways are great – they spend lots of money and put in a huge effort to keep routes open, so they can be taken over and used for a real railway when needed. If the route had had a road built on it, you would have to work a lot harder to return it to railway use, but because it is a heritage railway, it is okay to just shove them out of the way ? You could at least show a little respect. I think you would find it a lot harder to move them out than you think. Given the right reasons and the right incentive, they could possibly be persuaded that such a move is in the best interest of everyone. On the other hand, come along and say “thanks chaps, we will take over now, you can play with your trainset elsewhere” will result in a massive legal fight. I always had the feeling it was a solution in search of a problem. The problem probably being certain locals wanting a more civilized service that guaranteed them a seat* as it didn’t call at any major population centres along the BML. That said I sure the tunnels wouldn’t have finished at East Croydon and would have hovered up the stopping or semi fast beyond freeing up a bit of capacity on the fasts and at the Victoria and London Bridge. For simplicity, all frequencies are given as peak tph. In its entirety it’s electrified double track from East Grinstead to Copyhold Junction (and all associated works). This lets you operate the Lewes services (which I see as 3tph) via East Grinstead, giving East Grinstead 6tph. These East Grinstead services could be projected to Haywards Heath with very little infrastructure work on the BML…perhaps even just a 5th side platform to keep them separate and the provision of a 5th line from Copyhold into it. If you wanted to keep the Lewes services off the BML completely, you need 2m13c of quadruple track north of Haywards Heath, a new tunnel bore south of Haywards Heath, and the 4m27c of quadruple track to Keymer, with associated works as there are a few short bridges. Work would also probably be needed to realign Wivelsfield Station. …now, as you’ve all pointed out, this doesn’t add any capacity north of East Croydon. Fair call – but it does make better use of the capacity we have by combining two services into one. If a 6th track were somehow laid between South Croydon and East Croydon, then conceivably the Oxted route could get all the way to Windmill Junction without conflicting with the BML. A bit more jiggery-pokery through Windmill Junction gets you to Norwood Junction where the lines from Crystal Palace join…but if you give up serving Croydon (which, short of new lines, you simply have to do), then reinstating the railway through Addiscombe and running via Catford/Lewisham could happen, be it on the surface to Victoria/London Bridge or in a tunnel of some variety to wherever. I think PoP has shown that there probably is spare capacity between London Victoria / London Bridge and Croydon. It might take a bit of work to release it, but it’s very realisable. 1. The four-track section south of Croydon, especially between South Croydon and Purley. This is less acute beyond Purley once the Caterham and Tattenham Corner routes have diverged from BML. Tackling either directly is likely to be expensive and adds little extra flexibility or redundancy. For the first problem it would be possible to tunnel between West Croydon and Purley and route Tattenham Corner and Caterham services via West Croydon. As discussed before, a tunnel portal in the Purley area would not be easy to locate. It does nothing for the second problem. That leaves just one solution by process of elimination: routing more Coastal services via Oxted. Whether that links back into BML / Coasway via reinstatement of East-Grinstead to Haywards Heath or reinstatement of Uckfield – Lewes is up for debate. I think it depends whether there’s any intention of re-instating Eride – Tunbridge Wells. If there is, that suggests the Lewes route is the best, if not then as Mr jrt as pointed out, the East Grinstead alternative is more direct to Brighton. One essential though will be to ensure South Croydon is grade-separated. The station will need to be rebuilt with platforms only on the BML slows. The big problem with routing via Oxted though is combining fasts and slows on the same line. South of Oxted some passing loops would be needed but even between Oxted and East Croydon there would be a problem. Fast services wouldn’t want to stop at Sanderstead, Riddlesdown and Upper Warlingham. I think the only alternative in peak would be for 1/3 of services to stop at each station. The rare journeys between them would need to be made via East Croydon or Oxted (which would presumably remain as a stop for all services). The BML2 promoters seem to have no problem suggesting taking over the Spa Valley and Lavender heritage lines, so why would they balk at the Bluebell? Taking “East Croydon” as the issue for a moment, instead of the BML, how much of the traffic there is outward from zone 1 or 2, ie would a terminating service from the north release sufficient capacity to improve matters on the through services? It shouldn’t be impossible to build a couple of platforms to the west of the current station (albeit that the council may have plans in the area, in which case just move them below ground). As the terminating lines would be stoppers then they should be able to feed in to either of the slow sets without interacting with any fast services. I see nothing wrong with sending the heritage people to play with their train sets elsewhere if it’s in the public interest. People in East Grinstead may well be bought over by a 6tph service to town. But I’m not convinced that this use of the Bluebell would be value for money. The three extra tph which could be pushed over the Ouse viaduct still have to get beyond South Croydon. Sending anything via Addiscombe and bypassing Croydon doesn’t make sense, as many people from Sussex are heading there, even if the trains didn’t hit a pathing issue closer to town. There is no room to grade separate South Croydon Junction. It is densely populated with houses and flats and is on a secton where geography is against you as the ground is rising towards East Croydon. At a push you could use the allotments but as one of the few in the area that would be unpopular – it would also need some tight curves so would cost time. The same issue means that the line can’t be widened anywhere. South Croydon to Purley is busy but I wouldn’t think the slow lines are at capacity and the fast lines could take more without the stoats nest crossing manoeuvres. Re East Croydon platforms – room has been left under the new footbridge for new platforms. The barriers will need moving I suspect but that is pretty trivial. Yes – but not quite enough without some additional work being necessary. We will go into detail when I get around to writing the next installment which will be about the footbridge. Then I need to take some photographs around South Croydon to get people to appreciate the difficulties of grade separation there. Lewisham is also a major congestion problem, and one does not solve a flood by diverting the waters from a bath into a bidet. Taking over the old Selsdon line (which, I might add, has been built over in places, not least by Tramlink), would therefore solve absolutely nothing: you still have to get from Ladywell to… where, exactly? The only suggestion I’ve heard is to build a new terminus somewhere in the Docklands area. Why? Is there a massive demand for services from Brighton and Lewes to Canary Wharf? Because I’ve seen no evidence for it. BML2 collapses into vague hand-waving just after the sections about reopening the usual disused / heritage lines that have been brought up repeatedly in the past. The BML2 project is therefore a local transport project dressed up in regional transport clothing. Not sure I’ve seen the Docklands terminal suggested before, it’s always been a through tunnel to Stratford whenever I’ve read anything. That at least gives you the options of either heading up the WAML or taking over the line to Shenfield and sending CR1 up the WAML. Regardless, there’s clearly a market for more cross-London links (we’ll see how well Whitechapel manages with the two Crossrail branches), you just have to find suitable services to send through them. …also, I’m sorry if I’ve missed something, where does Redhill come into things? “heading east from London Bridge” should read “heading east from London Bridge on the Jubilee Line”. Would there be room for grade separation at South Croydon if you removed the platforms on the fast lines? Okay, Redhill is a slight exaggeration, but not a huge one: the route map on the BML 2 website still shows a very circuitous route, running trains up via Croydon, before running almost west-to-east via Lewisham, before turning towards Canary Wharf and Stratford. This route would be pretty slow compared to the present BML. Also, it duplicates a lot of existing rail infrastructure. An alternative, if much less direct, option is to tunnel from Croydon to Heathrow / Old Oak Common (according to whichever is most feasible), connecting with the Crossrail 1 infrastructure. You can then simply extend the Crossrail 1 Heathrow terminators all the way down to the south coast. What you lose in the kink to the west, you gain in not having to change trains to get to any of London’s Central Activity Zones, like the West End, the City, or Docklands. Any of the above is better than the current BML 2 project’s obsession with destroying Tramlink. I was attempting to be subtle. You weren’t, and quite rightly so. Doesn’t the Overground already do that? Granted, it terminates at West Croydon rather than East Croydon, but if Croydon itself is the intended destination, this doesn’t matter. A count of passengers alighting from Overground services and leaving West Croydon station during the morning peaks should be sufficient to demonstrate whether there is demand for such flows. TfL probably have enough Oyster data to provide useful data. In all fairness, what I’m proposing is in lieu of BML2, so it’s not really fair to lump all the same criticisms on it. All I’m proposing is linking East Grinstead to Keymer Junction via Haywards Heath, giving more BML capacity and the addition of an actually useful diversionary route. You want to build tunnels through Croydon? Be my guest. I’m just pointing out there is a simpler alternative to reinstating Uckfield-Lewes, and one that’ll give comparable times to the main route, too. …and enough with the dramatic language about “the current BML 2 project’s obsession with destroying Tramlink”. It’s a Tram. It runs perfectly well on roads as well as segregated rights of way. Trains don’t, ergo it makes sense to use a segregated right of way for a 416.16m 12-car train carrying ~741 @ 100mph rather than a 30.10m 2-car tram carrying 70+138 @ 50mph, if capacity is a concern. Re-routing the tram onto the roads for a few miles isn’t the end of tramlink. 😉 There are several issues of note with the proposals…but that really isn’t one one of them. mr_jrt – I suspect that Croydon tram users might disagree about this being an “issue of note”, and would be very interested to know how a fast and congestion-free replacement tram route could be created between Lloyd Park and East Croydon. Otherwise, while it might not be the end for Tramlink, it would be a significant blow. Re South Croydon, I don’t see a major problem with the allotments (except during construction), since a flyover could follow the existing line. An elevated line would generate noise and visual intrusion in this residential area, but there were two carriage sidings on the western side where the car park now is, so there would be a bit of room to play with if the fast platforms were removed. Towards East Croydon the Coombe Road bridge could be a problem to alter, since the Beddington-Rowdown 400kV cable runs alongside the road at at the same level. It’s not a very “main line” is it … more a “scenic route”. BSR? So the so-called “main line” is 18km longer, which is about 30% more! Yes, it would be lovely for all these out-of-the-way Sussex villages to have a better train service (or a service to start with) but don’t call it BML2 because it’s not. There is no reason – if it were needed – that the track between Three Bridges and Brighton can’t be doubled, a new fast line would have some diversions around the currently served places like Hassocks and Burgess Hill, but this super-long route is a ridiculous proposal. IMHO, of course. Removing most, if not all of those services from N of Haywards Heath. Note that it does relieve capacity on the BML & doesn’t clog up London termini. Note also the hopefully good interchanges with XR1 for people wanting central London. @Briantist – Just so! – and since it can only relieve the traffic from Brighton to London, as it doesn’t serve any of the existing intermediate stations, what the BML2 proponents are offering is, a 30% – more like 50% given the likely line speeds – increase in journey time between Brighton and London at a a higher fare. Who is going to use it when the following “direct ” train ( and probably the next one after that)will have already overtaken it? The BML serves many places on the south coast other than Brighton. If BML2 only took the east Coastway traffic away from the Haywards Heath route, that would surely reduce congestion on the existing BML. What would be the distance from Lewes to London Bridge via Uckfield and Elmers End, compared with the route via Haywards Heath and East Croydon? Indeed. If the indirect service was at TGV grade and didn’t stop, people MIGHT use it. The Coastway East traffic leaves at Wivelsfield, just south of Haywards Heath. And anything going further than Worthing from London will use the direct line from Three Bridges to Crawley via Christs Hospital. which is 7km – 18% more. @timbeau – whilst I take your point about removing some of the east coastway traffic, there isn’t actually a lot of this – Lewes,for example, is a small fraction of the size of the Brighton conurbation. You’ll have to dig yourself for the historical distances for the closed bits, but I got my mileages largely from the sectional appendices found here. And that’s never going to change, since the whole area is now the South Downs National Park. Also worth remembering that quite a few of the services that go via Haywards Heath split when they go south of there and rejoin when they go north. To my mind that demonstrates clearly the capacity squeeze though East Croydon and the relative quiescence of the lines over the South Downs. And, as they say, another thing: the Coastway West service is one of the least profitable lines in the country, whereas the Brighton Mainline is highly used. The Coastway service both ways either terminate in Brighton Central Station, or have to bounce though there with a driver changing ends. If it wasn’t for the two Universities (Sussex and Brighton) having large campuses at Falmer, there wouldn’t be a train service to Lewes. Yes, it’s very bust once day a year (Bonfire Night), the presence of the castle and the fullness of the Prison don’t make for that many train journeys. What are your sources for your figures? Mine are the sectional appendices and closure notice from the Bluebell website. …so a difference of just 3m8.5c or 60.7km vs. 65.7km in new money, if you prefer – a difference of 5km – not 7km…which when you take it to Victoria gives a difference of ~7.5%. Given these trains will travel at a rough average of about 75mph, gives a time difference of about 2½ minutes. Which is s*d all, really. Fair enough. The SA does give line speeds, but obviously only shows open railway. It’s mostly ~70mph with some 40-50mph around Dormans/Lingfield and down to 30 in the terminal platforms at EG. Given this is slightly out of date (2006) and I know the single track section north of East Grinstead has been removed, speeds may have improved slightly, and if no longer terminal the line speeds throguh the station would be higher. I guess a fairer average would be more like 60mph then, which is still only 5 minutes…and could probably be improved if required. A Eastern BML2 using E Grinstead would surely mean that Lewes to London trains were now approaching East Croydon on the slows not the fasts and wanting to cross. I can’t see that being a good thing. Although it would make Keymer Junction better but isn’t there the possibility of grade separation there? Google Maps. Using the “Measure Distance” (right click, bottom menu option) . Seems much more accurate than your way. Done using lots of points by the way, to follow all the line curves. Looking forward to the South Croydon photos. To add to the comments about the residential nature of the area I should add that one of these is owned by me. I don’t totally object to being compulsorily purchased but it would be a bit of a shock. Do you have any idea of the costs for your suggestions? If anyone rally wants distances via Uckfield … I can get them from my 1922 Bradshaw copy. All along it’s all just been pointing out Uckfield isn’t the only option on the table for relieving the BML. Musing on it though, I can’t imagine it would be prohibitively expensive, though. The Borders project is far grander in scope and that came in under £300m for ~30 miles of partially-reinstated railway requiring some really, really, major infrastructure works. HH to EG is ~10 miles and whilst it would probably require reconstruction throughout for operational double-track railway standards, the only major infrastructure on it is the Imberhorne cutting (which would need to be finished off) and the short bits of missing embankments and the bridge between Ardingly and Horsted Keynes. I wouldn’t dare put a figure on it…but can’t be that much, surely. The works for a 5th platform at HH and a running line to meet it equally are in the < £20m range, surely. For the full works, the cost of a new tunnel bore south of HH and the quad tracking…your guess is as good as mine. NR are adding a 3rd line for a short length as part of the Keymer grade separation, so we might get some idea in the future. You still haven’t actually solved the problem though: the congestion at Croydon. As I pointed out earlier, diverting the trains via Lewisham doesn’t fix this as (a) many people actually want to go to / change at Croydon, and (b) Lewisham is just as serious a bottleneck as Croydon! If you’re going to suggest tunnels under London, then you might as well go for a straighter, faster, route that can take advantage of the speed of modern trains. At which point, you might as well go for a new-build project and call it either “HS4”, or “Thameslink* 2”. Come to think of it, given the proposals to extend Ashford HS1 Domestic services to Hastings, why not take that a step further and extend them closer to Lewes instead? Alternatively, build new to Uckfield, then build a short link line to a convenient location on HS1 and use that to get into London instead. The 140 mph. trains means you still save time on this route, and the Uckfield line to Tonbridge isn’t particularly sinuous. More precise AND more accurate. If you can prove otherwise demonstrate so! Looking at this scheme, and assuming – just for now – that the line between Keymer Junction and Copyhold Junction can cope with an extra 3 tph if Keymer Junction is grade separated but not Copyhold Junction, then it’s reasonable to say that a Bluebell acquisition scheme needs 10 miles of extra track whereas Lewes to Uckfield would need slightly less, say nine miles. The Uckfield scheme was described by Mott Macdonald here as costing the similar amount to a recent (in 2008) scheme, so let’s assume for simplicity the two schemes are similar in complexity. That would bring in the Bluebell scheme in at about £125m at 2008 prices given the quoted £141m cost of Uckfield to Lewes. But there have to be hidden costs on the Bluebell. The base figure for Uckfield to Lewes (based upon a service terminating at Lewes with no intermediate stops) excludes electrification and needs just one new four car train. The Bluebell needs ten miles of third-rail electrification (assuming it’s allowed, don’t shout me down) and must need a number of new eight/twelve car trains. Now let’s look at benefits. Granted there are an extra 3 tph from Lewes to East Grinstead, but there are few extra journeys. On the other hand, Crowborough to Lewes is a major route by car – but still the Uckfield scheme has a BCR of only 0.78. I’ve argued that Mott Macdonald underestimated demand to Lewes, but not to take the BCR to anything worth building without developer contributions. The Bluebell scheme must have a lower BCR than the Uckfield scheme – unless anyone thinks I’m missing anything. And I’m really not sure it can be done without grade separating Copyhold Junction as well. I find this very hard to believe (that Google is more accurate). The Network Rail values are probably taken ultimately from the details of the original Act of Parliament authorising the railway. These distances would be very accurate as otherwise there would be all sorts of land disputes. Do not underestimate just how consistently accurate surveying on the ground has been in the past. True the railway, very occasionally may have moved slightly and have been slewed resulting in minuscule changes in distance but this would be exceptional. So I would throw this back at you. If you can prove otherwise that Google is more accurate then demonstrate so with details. If not, drop the subject if you have nothing substantive to add. The above should read “£157m at 2008 prices”. Maths upside down, apologies. Google Maps (and similar services) are optimised for bandwidth and rendering speed. A level of accuracy of the level provided by an experienced land surveyor with a theodolite is some way down the list. The photo imagery has to go through some complicated processing in order to make it all stitch together properly. The conventional mapping data that overlays that imagery tends to come from the likes of TomTom, and similar companies. We’ve all heard the “And finally…” news items about some hapless driver ending up in a river after blithely following their GPS’ instructions and failing utterly to look out of that big glass window thingy right in front of their face. Similarly, the HGV driver who ends up stuck in a tiny country lane that their GPS system told them was an on-ramp for the M3. They were relying on exactly the same datasets as Google Maps. Which gives you an idea of how inaccurate such datasets can be. I bow to your grasp of the figures as your reasoning makes sense to me, but for what its worth, my full scheme removes the pressing need to grade separate Keymer Junction (though it would be beneficial for more complex service patterns as well as cross-platform interchange at Haywards Heath), as all services could be on the eastern pair of “slow” lines, so you could downgrade the junctions between them and the current “fast” lines considerably, if so desired. …incidentally, I just spotted on the SA that the viaduct between HH and Wivelsfield is named – it’s the “Vale Viaduct”, and is 70m long (3.5 chains). Longer than I thought, so probably more of an obstacle too. …though, as mentioned above by another poster, avoiding grade separation at Keymer just shifts the problem of getting to the fast lines from there to South Croydon Junction. The official figures, where available, must surely be more accurate than Google Maps. But comparing two routes using different measuring systems (e.g BML1 by official figures and BML2 using Google (at least in part) is likely to lead to an inaccurate comparison (and it’s the comparison, not the actual distances) that we are interested in here. For a fair comparison, it is best to use the same measuring stick for both. As the Oxford Companion to British Railway History notes, the primary purpose of mileages nowadays is to indicate location, rather than distance. The difference may appear arcane, but as routes change over time and mileages are not remeasured the difference between marked mileage and distance can add up, and there are “long miles” and “short miles” around the railway network where changes mean that distances are no longer accurate, but location mileages are unchanged. What appears to be an example is on p159 of the NR document linked to above by mr_jrt, where the mileage reduces (rather than increases) going south from Windmill Bridge Junction (10m 12ch) to the point where linespeeds change just north of East Croydon (10m 07ch), presumably because of the various rebuilds over the years. So official mileage figures are undoubtedly accurate as regards to describing a location, but not necessarily when describing distance. Going back to grade separation at South Croydon, another factor is gradient. South of the junction, the Oxted line initially rises more steeply than the main line ( 1 in 83/110 rather than 1 in 264), favouring an Oxted flyover there (the height difference is very apparent by looking at the bridges over Selsdon Rd), but north of the junction the gradient continues downwards* at 1 in 264, lengthening the necessary ramps, with Coombe Road and its HV cable looming as a problem. *Anonymous at 1802 on 3 Jan said that “geography is against you as the ground is rising towards East Croydon”, which is not so for the railway – and if it were the case it would help by reducing the length of the ramp(s). Possibly but mileages on the Brighton main line through East Croydon were measured from London Bridge, whereas distances from Victoria are somewhat longer. GF: as shown in the NR document, nowadays Network Rail’s Line Of Route SO500 runs from Victoria to Brighton, with mileages from Victoria; London Bridge to Windmill Bridge is part of LOR SO510, continuing to Epsom Downs. I take it HH is Haywards Heath, but what is EG? @Mike – Possibly so but that does not necessarily change the actual mileages. East Croydon was measured as 22 chains shorter from London Bridge than from Victoria. 04:15 Brighton to London Victoria will be diverted via Lewes. GF: yes, but both the mileages I quoted are indicated in the NR document as being from Victoria (with the lower one being further away), so I’m not sure of the relevance of London Bridge mileages to the discussion. @Mike – I have discovered the difficulty you have. In the 2009 NR Sectional Appendix you downloaded from the link given by mr_jrt, the distance is indeed given as 10m 12ch (with a figure of 9m 69ch underneath in brackets) at Windmill Bridge. Of course, for those who remember, one could easily argue that Victoria is closer than it was in the olden days to East Croydon because of the significant distance the buffer stops were moved towards Battersea Park to enlarge the concourse on the Brighton side….. I wonder if there’s a viable case to be made for rafting over the cutting south of East Croydon, selling most of the air rights to developers to cover the costs of doing so, while retaining space for a pair of segregated tram tracks. You could get most of the way to South Croydon with this. With some short on-street sections, all on residential streets, rather than major roads, you could then take over either, or both, the Caterham and Tattenham Corner branches. The latter is close enough to the Epsom Downs branch that extending onwards from there to Sutton might be easier than the original proposed route via Mitcham Jct. Alstom already have a low-floor Citadis variant capable of 100 kph (62 mph), so journey times would increase only slightly, even including the interchange at East Croydon itself, while the removal of those two branches would release some capacity through East Croydon and reduce the network’s complexity, so the benefit would outweigh the cost, I think. You there! Step AWAY from the crayons! Drat, the rozzers! YOU’LL NEVER TAKE ME ALIVE! Fine by us! Take ‘im down, lads! Use of excessive force is authorised! It does, but the pressing need for capacity is to and from Brighton. Your scheme might work better of some (or most, or all) of those extra 3tph went to Brighton rather than Lewes. That clearly needs grade separation at Keymer Junction and probably at Copyhold Junction, in which case the quadruple track between them might be a luxury. Acknowledged that none of this works unless something can be done at South Croydon. It strikes me that the overall journey time is what counts most, not the mileage, although for those who are keen to know, the October 1960 Southern Central sectional appendix lists Horsted Keynes to Haywards Heath, station to station, as 4 miles 1179 yards. The maximum permitted line speeds were the same as the BML, apart from a couple of locations, on both the South Croydon-East Grinstead and Horsted Keynes-Haywards Heath sections: 85 mph for loco-hauled passenger trains, 75 mph for multiple units, and 60 mph for freight. Maximum speeds were limited for this route only at South Croydon Jcn (20-30 mph), and at Horsted Keynes (20 mph). Trains running through south of Haywards Heath faced a further 20 mph limit at the junction onwards, but all usual trains would have called at Haywards Heath. At Hurst Green Jcn, only the Tunbridge Wells/Uckfield line had a speed restriction (35 mph). The road between Tattenham Corner and Epsom Downs crosses the racecourse: I can’t see the course owners being happy about putting tramlines across it. And getting trams to Sutton is not an end in itself – Sutton town centre is well-served by trains, in five directions. The proposed Mitcham-Sutton extension is to serve the area it passes through. The population served by a Mitcham-Sutton route would be rather larger than that on a Chipstead – Sutton route through the green belt. Why couldn’t the connection go via the B2221? On-street around Tattenham Crescent to Old London Road, then run (segregated) alongside that to Longdown Lane South, back on-street along Bunbury Way, and you’re at Epsom Downs station. There’s enough development along both branches that a couple of additional stations could be justified, increasing the line’s catchment areas. Additional stops would also make the line more attractive for local journeys. In particular, it makes Sutton itself a more viable shopping destination for people on the Tattenham Corner branch. This line wouldn’t necessarily make the original extension unviable. You could build both, linking the two routes via an on-street section in Sutton. The advantage of the via-Tattenham route is primarily its benefits to the heavy rail routes, but it also provides some useful orbital journey options as well. The long-term goal for Tramlink should be to make it more than simply a bunch of radial links into Croydon. It needs multiple hubs, not just the one. Extending either of the two proposed Sutton routes beyond Sutton would help with this, and also help balance loadings. 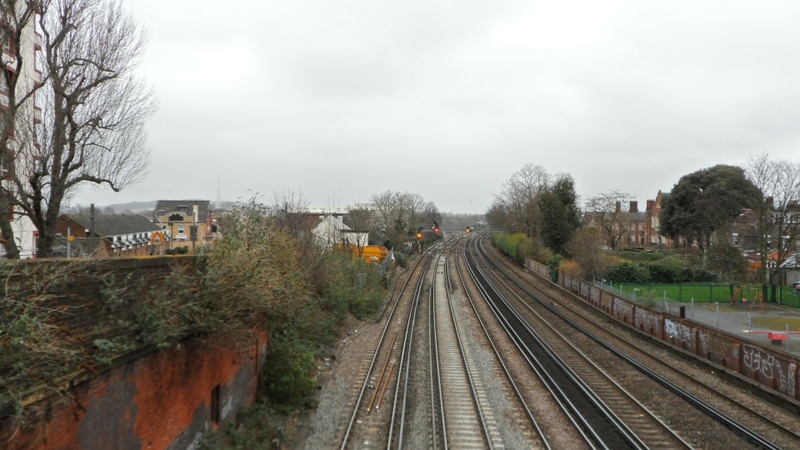 Removing the Epsom Downs branch from Sutton station also opens up the possibility of a developer-funded regeneration project that includes a station rebuild providing two through island platforms. This allows the Sutton loop to be entirely segregated from the Dorking trains during the peaks, simplifying the network even further. Without removing the Epsom Downs branch, this wouldn’t be remotely feasible. OK, so hopefully rocket science over, and we want to send a train from Copyhold Junction to South Croydon via East Grinstead, not to Pluto via the Moon. We’ve established it’s about 6km further than via the BML. Assume – for now – that South Croydon can be fixed at its current line speed, and that a peak train going via the Bluebell would stop at East Grinstead and one of the other stops, as suggested earlier. Assume also that the BML train stops at Gatwick, as one stop is fairly realistic. How much longer would the Bluebell route take? OK, ignoring the fact that the Caterham and Tattenhams are full at Purley in the peak. How do you plan to get the tram from South Croydon to Purley? You mention residential roads – I can drive it round the back roads but the 120 degree junctions in several places wouldn’t lend themselves to trams. Unless Milton Clevedon pops back up and the documents contain line speeds, it’s going to be hard to say, and even then, short of some horrific distance/speed calculations we still won’t know. For simplicity’s sake stop-wise, and given the existing services are fast currently, let’s just treat it as having the one stop at the largest settlement – East Grinstead, as this negates the stop at Gatwick. Regarding Keymer, I looked at the RUS expecting it to back me up regarding more trains to Brighton coming from Keymer grade separation. It doesn’t: it suggests the net impact (provided things up the line are also done) would be 1tph to Eastbourne and 2tph to Hove. Now there’s one for PoP to explain to us in a later episode, because that suggests to me that there is a constraint at Brighton. This could be a constraint at Brighton, possibly insufficient platforms, however I suspect it is more a case of sending them where they are most needed. 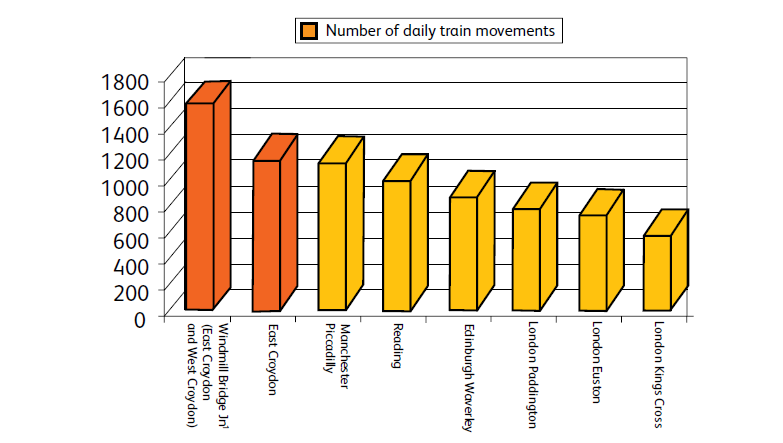 If you look at figure 3.13 in the 2010 RUS you will see that in the high peak hour in 2009, trains to London from Brighton, Lewes and Hove had average seat occupancy rates of 40%, 67% and 90% respectively. Anyone getting on at Brighton is almost guaranteed a seat, but this is not the case at Hove. As you say, no doubt PoP’s forensic analysis will throw light on this in the future when he gets to the end of the line. The constraint “at Brighton” is more likely to be the previously-mentioned & probably short-sighted removal of the down loop platform track @ Preston Park?? Agree with S C Ed on this one and there will effectively be more capacity added Brighton inwards by TSGN so more capacity on the Mainline services to Coastway destinations would therefore be a logical step beyond that especially as lenghtening dedicated Coastway only services wouldn’t be that easy or cheap in the same timescales. Thanks. I did not know about this. Personally I think it makes more sense to send any additional services towards Hove and Lewes because of the relative loadings, but maybe this constraint has made the decision about where they go easier. I agree that Brighton and Hove could do with a metro service. How this would (or more likely would not) fit in with London services and the faster services to Portsmouth and Southampton is another question. I recall PoP said he would touch on this in future too, obviously from a London perspective. I’d actually go even further and suggest that it should encompass Worthing to Lewes as I don’t think the East Coastway is quite as quiet as the picture you paint. Try getting a train on match day, or squeezing on to an Ashford service. Lewes will not expand, but Falmer probably will increase in importance. Sussex Uni are in the process of appealing the rejection of their recent plans for 2500 new student accomodation units on campus. In addition the City Plan identifies released land at the former Falmer High School for Brighton Uni accommodation. The football club is likely to submit plans for an hotel in the coming months. I would not rule out Falmer as a possible site for a future Park & Ride eventually either. There is a large market for East West travel across the city, but this is dominated by the A27. Erratic connection times at Brighton and having to negotiate ones way from platform 1 to 8 “against the tide” doubtless puts many people off. Through services, as you are probably aware, are limited in length (from memory this 4 cars at most, perhaps even just 3), but obviously fouling up the entire throat of the station is probably the reason that none are timetabled to my knowledge at present. I do wish they would reopen Holland road station. It has as much justification as London Road does…but ce la vie. The #7 bus does work well on that corridor. I do wish some people proposing new or reopened stations and lines would add more facts and costs to support their crayoning. If the 7 bus works well in the corridor, what is the need for a reopened station then? Because I only use the number 7 occasionally for leisure purposes when I’m in a hurry (the majority of the time I just do the half hour or so walk), but the area is densely populated, and already has a metro shuttle of sorts running thought the site between Hove and Brighton for stock movements anyway. 😉 …making it more useful by having a midway stop would increase usage. Same justification for having London Road station stay open, basically. A reopening would potentially diffuse the loadings on Hove and Brighton station’s concourses as the passengers would already be on the paid-side. The Brightro was something I did in 2004, when there was the possibility of “public investment” in public transport. Brighton has an excellent bus service in terms of coverage, but it is very slow. On a good day, it can take 60 minutes from east to west, 90 minutes to 2 hours on busy day (you can do it in 10 minutes at 4am, for example). Where there are bus lanes, buses flow. Where the are not, everything gets blocked. The whole thing can be justified, if anyone is interested. The idea was something DLR-like. Just looking at a reproduction of an old map (appears to be pre-grouping), and interestingly, Horsted Keynes – Oxted via East Grinstead is marked as the ‘Inner Circle’ and Lewes – Oxted via Eridge is marked as ‘Outer Circle’. So that’s a third definition of those terms for LR readers to add to their dictionaries. @JA -but misleading for this forum, in particular, where the terms Inner, Middle and Outer Circle are well established and have completely different meanings. @mr-jrt – Extend Volks Electric railway perhaps? Restore the seagoing tramway – even better! As I can’t go off topic with the Volks upgrade…. One futher observation on the London bound West Coastway train loadings. I suspect there is quite a lot of suppressed demand for Hove. As indicated above it is sometimes not possible to get a seat at Hove. The annual season ticket prices to London from Hove, Brighton and Portslade are the same. I think there must be a significant number of commuters for whom Hove is the closest station but nevertheless choose to travel from their second nearest station in order to increase their chances of getting a seat. Station usage figures in recent years lend weight to this. Whereas Brighton (23%) and Portslade (35%) have seen growth in the last 5 years (exits and entries), Hove has only seen a modest 5% increase. To those saying Tramlink and trains couldn’t share the Lloyd Park to Arena corridor…. Rather than cut a new tunnel, more likely BML2’s proposal to run the trams on the streets above (strange idea, I know!) Indeed, it needn’t follow the same alignment but could, for example serve Shirley instead of Lloyd Park. Re Hove, I hadn’t considered Thameslink service expansion to Brighton, so grade separation at Keymer may well be addressing crowding at Hove. But a warning regarding running more London services to and from beyond Hove – I know there are issues with level crossings on the West Causeway restricting the amount of possible traffic. Can extra services serve Littlehampton, or would they need to be terminated at Hove? Indeed, is there demand for increased services from Littlehampton? The BML2 website makes it pretty clear they are more than happy to throw the trams onto the nearest street and make vague hand-wavy gestures about how this is will not cause problems with the service quality and reliability. Someone needs to explain to them how the town-planning term “Croydonisation” came about. That the trains are full when they get to Purley is not a big surprise, given the train frequencies. You can buy longer trams and run them more frequently and actually exceed the present passenger capacity of both lines. Now you run along the edge of the allotments. Split the lines up: one reaching the Sanderstead Road next to where it passes under the BML route, and the other running down Glossop Road. You’ll need to set up a one-way system for this to work, and the footpath to the allotments would need some modifications too, but there’s plenty of room, and none of this is difficult engineering. You can now get both lines onto Kendall Avenue briefly, before the lines go their separate ways again: one down Florence Road, the other continuing along Kendall Ave. In fact, there’s quite a bit of scope for widening the A23 beyond Tesco, most of the way to Reedham station, as the properties are set some way back from the road here. It’ll cost a bit, but it’s work that would probably have to be done eventually anyway. This is ideal: you can add a tram / bus lane to either side, until you get to the car park at Reedham Station itself. From here, you take over the existing railway. It’s not pretty, the one-way sections aren’t great, and there’s a fair bit of on-street running, but it’s doable, and it should work. The one-way sections are common overseas, and Tramlink’s own Croydon loop gives a pretty good idea of how it’d work. Model created using Open Transport Tycoon (OTTD). Screen captured using VLC Media Player. Video edited using Serif MoviePlus X6. Not quite what I was expecting but still very tricky those one ways are narrow. Glossop Road is a parking nightmare with no replacement nearby. Purley Downs would probably cope but realistically you might be better with Grasmere Road/Warren Road then rather than try Brighton Road which is a nightmare at the best of times. I suspect that local opposition would very much destroy the chances. It is after all a very conservative area (a capital c would have been just as appropriate). I also suspect that those coming off the tattenham branch and in Purley (count me into those) would be less than enthusiastic to lose their direct london trains with a seat to pay extra for a tram to East Croydon and no seat! Even if it was more frequent. I have been croyoning for years trying to use the stub of the Selsdon branch to extend trams to Purley but I cannot get beyond Sanderstead. Maybe Sanderstead village would be a better direction to go, filling an actual steel rail gap. @Anonymous 7 Jan 22:14 – “Maybe Sanderstead village would be a better direction to go” – by that I trust you mean where Sanderstead actually is, as opposed to the location of the station of that name. Swing around to the right and you will see the lower level of the Brighton main line overbridge. Buses use Selsdon Road but turn just before the low bridge of the Brighton line. Then, just how much of the popular and well-cultivated allotment space will be left after you run a tramway through it? and then swivel around to see the railway bridge. All this is almost as bad and impractical as the suggestions to parallel or replace the tramway between Coombe Road and the Arena side of Addiscombe with the BML2 or whatever. And then what happens after reaching Elmers End? Running main line services over tracks perhaps destined to form the Hayes extension of the Bakerloo with ATO isn’t even worth dreaming about. I suggest everyone puts their crayons away. The draft Sussex Area Route Study published last October suggests either starting all the additional 6 BML paths created by the package of measures it proposes from Haywards Heath, or 3 from HH, 2 from Hove and 1 from Eastbourne. So the level crossings on the West Coastway would not be impacted (or the West Coastway East as the document somewhat confusingly calls it, to distinguish it from West Coastway West and East Coastway). I suspect that lack of demand rather than level crossing down time is the primary reason for not extending to Littlehampton. Some minor works would be needed at Hove to allow for more reversals there. Currently just the twice hourly Brighton/Hove shuttle is reversed at Hove. The best BCR seems to apply to one of the options where all 6 services start from HH, but I’d imagine that trains leaving half empty from HH would not go down well with those who struggle to get a seat at Hove. Note also that it is planned to introduce an additional peak time, peak direction only only once hourly Littlehampton Thameslink service, although I can’t recall when this is planned to start. I recall this is 4 to London AM and 5 to Littlehampton PM. I assume that the 6 additional paths mentioned above do not include this new service. This was announced when the new TSGN franchise was awarded. Anyway, I await with interest the next “A Study in Sussex” installment. They are fascinating. Thank you for pointing out the problems with Anomnibus’ Selsdon Tramlink crayoning. On street running might be possible although I am sceptical. The point I wanted to make though is that I don’t think Tramlink is as obviously a barrier to BML2 as some claim. That doesn’t mean BML2 is the right scheme either. Theban says “That doesn’t mean BML2 is the right scheme either”. Quite. I suggest that a good foundation for sensible discussion of reasonable schemes might be to adopt a general pretence that BML2 had never been proposed. This would avoid endless tedious discussions about whether various other schemes might be “better than BML2” (a distinctly soggy triumph). Such other schemes may still be proposed, of course, but would have to be justified, explained, costed etc independently, without comparing them to a foolish scheme which is full of well-known fatal flaws. The platform work at East Croydon (which seems to have been going on for a very long time with very little change) was stopped altogether last week. I heard yesterday from a member of platform staff that a construction worker fell through the roof of the refreshment room on platform 1/2. Not killed, but apparently work was stopped until H&S have given clearance. Work continues at the building site on the Dingwall Road (west) side of the station. The space where an extra platform might go is at present partly covered by portacabins. Also mentioned was that the opening of the Cherry Orchard Road (east) end of the new footbridge was dependent on money coming from Croydon Council. Just a quick question about something someone mentioned earlier, where was the subway at East Croydon and when did it close? All I can find about it on the internet is one picture from an old national rail website. If the bakerloo line does finally get approved, it will be interesting to see what happens to BML2 (They posted a very dismissive article about the bakerloo line being extended relatively recently) as the plan will just not be able to progress any further. I wonder will they just give up or try to find an alternative. It was at the north-middle end of the station, where the new bridge is. It was accessed by some very, very long ramps which made changing platforms an Olympic sport, especially when you might need conveniences.. They were closed off the day that you could access the new bridge which was … A few years ago. Not surprised there are no photographs, the risidual stale urine and damp mould smell that British underpasses smell of wouldn’t be a popular snapping spot! The East Croydon subway was underneath where the lifts are now (with long slippery ramps down from close to the ends of the buildings on the platforms. The lift on Platform 5 and 6 has key access to the remains of the subway (there was a ramp up to the outside of the station gated off here, I assume the lift accesses that). The subway closed when the bridge opened which according to this article (with accompanying Network Rail video and whinge about the council) was January 2013. I’ve just been reading http://www.networkrail.co.uk/long-term-planning-process/south-east-route-sussex-area-route-study-draft-for-consultation.pdf and it is frighteningly sane compared to “BML2” stuff. I’d certainly take a look if you’re interested in new track layouts – right at the end – and the real justification for Uckfield to Lewes! I was asked how I’d get the tram from South Croydon to the branch lines, the implication being that it wasn’t possible at all. I gave an answer. I do not claim that it is the only solution to the problem. I also don’t claim that it is possible to build such an extension without spending any money on sorting out the odd bridge here or there. You have to spend a little money on such projects. The Dalek Rebuttal (“Oh no! STAIRS!”) doesn’t wash, sorry. Cow Lane Bridge near Reading saw a complete rebuild as part of the Reading upgrade. I’d argue that replacing the bridge over Purley Downs Road would allow some improvements to bus routes, and would not be solely of benefit to trams, so there might be a case for its replacement even without a Tramlink extension there. The Capital Business Centre you mention is easier to modify / adapt to the tram’s needs than a row of houses. Demolish a big shed and you rarely have to compensate more than one or two businesses at most, and leasing a similar shed somewhere else is rarely as eye-watering as the money needed to compensate a bunch of suburban London home-owners. You get more bang for your buck. This makes building through such sites much better value for money, even if you have to knock some sheds down. In this particular case, there’s also ample scope for extending the allotments to offset the land-take needed by the tram. While I agree that the case for converting the two branch lines to light rail has its pros and cons, I don’t buy the argument that the main problem is the engineering. I do feel that having direct access from Tattenham Corner to, say, Sutton station, would also be an advantage: passengers can choose the much closer (and less congested) West Croydon route to get to London instead of cluttering up the BML. Personally, I feel light rail is a much better fit for low-density suburban landscapes like this than heavy metros. right at the end – and the real justification for Uckfield to Lewes! OK I give in which page? Forgive me, I’m missing something. Which track layout diagram gives a justification? Anonymous @ 13:54: IIRC, the ramp was added to the subway in about 1990, when the ‘Post Office’ platform shown on the 1953 track plan was infilled to create what is now a small car park. A précis of those two sections. Couldn’t some extra west coastway services be run via Horsham, Dorking and Sutton like they were around 30 years ago. This would give Sutton a more frequent fast service into London. However I fear this may require some passing loops in congested areas. “right at the end – and the real justification for Uckfield to Lewes! Regardless of the direction and layout of future connections at Lewes (and alternatives have been proposed that would allow through running from Brighton without reverse), capacity limitations north of Uckfield mean that it is unlikely at times of diversion that more than 1tph additional to the existing Uckfield service could be diverted this way without doubling the single line sections of the existing branch and associated re-signalling. However under the scheme assessed in Network Rail’s 2008 report on the route, diversionary benefits would be predominantly for East Coastway passengers, with any passengers from Brighton only able to use the route with services reversing at Lewes, and passengers from the West Coastway and any stations north of Brighton on the BML receiving no benefit. Critical amongst these was the fact that without a new railway from somewhere south of the Croydon area on the Sanderstead route to somewhere in inner London, reopening and upgrading of the route “The conclusion is re-enforced therefore that Lewes – Uckfield adds value only when combined with a new lines scheme north of Hurst Green/ Sanderstead. This is likely to be outside the timescale of this study (2043) but nevertheless some comments can be made to build on the position outlined in Network Rail’s Emerging Strategy for CP6 BML report for the Department for Transport (DfT) which touched on the closed route between Lewes and Uckfield in the spring of 2014. On the current understanding of demand growth, it is outside the timeframe of this study to determine what shape such a scheme would take, save to recognise that protection of the existing Lewes – Uckfield alignment is a sensible approach for the future. That report noted that with a long term new lines solution in mind safeguarding of the Lewes – Uckfield alignment was sensible. Since I apparently have to very carefully watch my words these days, all I’ll say regarding the west coastway that you all seem to be discussing freely is that the problem is that it’s a very busy two-track route, with several level crossings, in a largely built-up area, and has to provide paths for mixed all-stations local and longer-distance fast services. The easy fix for mitigating the immediate congestion is to get to the end of the rolling stock switcharoo and get 4-car units on the line, moving the 3-car 313s on, to most likely either their final role, or indeed, the scrapyard. I don’t have the information to hand but I would hope that platforms would be long enough for 8-car services so doubling up in the peaks remains viable. …but beyond that you simply need more infrastructure. Loops at stations (not that there’s room, anyway) don’t solve the level crossing issues, and don’t really get you many more paths for semi-fasts from further afield, anyway. I’m not allowed to so much as suggest the sole remaining option, apparently, so I’ll have to leave it there. The differences at Portslade at are presumably to stop Eastbound 12 car trains blocking the level crossing when calling there. But I still like the idea of the Arundel Curve as a means of duplicating a route from Brighton. The RUS suggests that the main barrier to it is platforms at Brighton. So could Brighton station be reorganised to provide more 12 car Hove facing platforms? Correction – Only one platform can take 12-car trains from Hove but it is Platform 2, the one next to the westernmost one – Platform 1, which can only take 11 cars. Platform 3 can only take a 4-car train from the Hove direction but a 12-car from the Preston Park direction but we are getting ahead of ourselves. I don’t think it stretched as far as that and what was intended to be said was done so early on. The only relevance is why it is pretty useless as an alternative to the Brighton Main Line. Basically it takes a congested slow route into London and misses out Gatwick which is a major destination. Actually Dorking-Sutton – Streatham Junctions is not that congested is it? It managed to take the long distance traffic until kit was diverted via Gatwick in the 1980s, and I don’t think congestion was the reason for the change. Perhaps I was a bit sloppy and “slow speed” would have been better than congested. As I understand it, the main reason for the change, and certainly the reason why it won’t change back, is that business supports the Gatwick routeing because it increases the workforce catchment area. @PoP And I was hoping for an in depth understanding of where the pinchpoints were with the Horsham-Dorking line. Oh well, at least I feel free to speculate now. It is the final route into Sussex after all! I’ve always had a desire to suggest putting Crossrail 2 into Dorking, extend it to Horsham and then advertise Horsham as an interchange between Crossrail 2 and Thameslink. But I don’t think anyone would fall for it. More seriously Horsham-Vic via Dorking off peak seems to be 1h16m compared to 57m via Gatwick. But really it is useful because it serves a different area, but that use is limited by it being the only rural railway in Southern’s bailiwick and therefore only 1tph and rather unloved. Were it more frequent then potential connections via the SWT services could be reasonably useful. Given the limitation on the junction with Hove only be available to 4 car units, why not abandon it? I.e. make Brighton 2 stations, one BML & East Coastway and the other West Coastway. Rebuild the station put a third platform in and shuffle everything east into the space created by reducing that large platform block. You then have the potential to run West Coastway services from Brighton to London via Horsham and then also Littlehampton to London via Haywards Heath. Hove passengers use the latter and Worthing the former. Horsham via Dorking is faster than via the sacred Gatwick airport …..
And, we’ve seen, both here, & in the wider world, complaints re the service south of Horsham to Littlehampton, Bognor & not-round-the-curve to Worthing. Admittedly, the ex-LBSC’s “Portsmouth road” has sharp curves or other speed restrictions at: Streatham Jns, Mitcham Jn & Sutton, but it is noticeably shorter. Does Gatwick really, actually need even more trains through it? In order to avoid us going into repetition mode I covered what I intended to cover in part 2. And its not about whether Gatwick needs more trains to London. It is about people in West Sussex being able to work at Gatwick and get there by train. I thought the site is called London Reconnections because … It is about people in West Sussex being able to work in London and get there by train. My comment above (11 January 2015 at 15:49) listing the items from the Sussex Rail review has been restored. So, you may have missed it. Comparing apples with oranges, I’m afraid. The Dorking-routed service calls at all stations to Sutton (eleven of them), the Gatwick route is a semi-fast (only five stops to East Croydon). What were Horsham-Vic timings pre-1978, when the fast trains went via Sutton and didn’t call at Boxhill, Holmwood, and the like? They already can. I don’t understand the logic in demanding that they be able to do so from every station along the south coast of England without a change of train. Indeed. The Southern network, lacking major intercity traffic, almost certainly had to grow its market by serving more places rather than just larger places with more capacity, and the network was designed and built to this end. The London, Brighton and South Coast Railway did indeed quadruple their mainline, but to get a better return on their massive investment they build the new pair of lines via Imberhorne, not Balcombe, precisely so they could serve more population centres. Connecting lines between these “main” lines then allowed the faster services to be routed between them, freeing them up and enabling the (by modern standards) infrequent local services to operate. This worked well with Victorian usage levels….less so with modern levels. If you’re going to route everything via a single point you need to massively expand capacity serving it, and that means the major investment required to match capacities both to and from it. And it is not disused. I have cycled down the parts that are intact on a number of occasions. And it doesn’t solve the problem of capacity at the London end. In fact remind me, what problem does reinstating it solve? Words (almost) fail me. It is a massive station and I think it may be listed. Given how dependent the economy of Brighton is on it I really cannot see them tolerating all that demolition and rebuilding for a very limited dubious purpose. For comparison think about how popular demolishing St Pancras and rebuilding it would have been. Horsham 10:43; Dorking N 11:02; Sutton 11:20; Victoria 11:42. So 59 minutes. Strangely the 10:41 from Horsham divided into three at Three Bridges after stopping all stations then the first piece Gatwick, Redhill East Croydon arr Victoria 11.46. Part 2 was all stations to East Croydon and then Victoria, part 3 went to London Bridge. And I thought trains only divided on the way out of London! Brighton Station is indeed listed as is the London Road viaduct that braches off Eastwards just North of the station (both Grade II*). Other than tweaking the timetable to improve connection times I don’t think there are any easy options to create better Coastway through journeys. Looking at the draft Sussex Area Route Study, the thing that strikes me is it doesn’t actually create many paths to where they are most needed in London. By 2043 it predicts much stronger growth to London Bridge (115%) rather than Victoria (34%) in a high growth scenario. However, of the 6 additional paths it proposes only 2 will go to London Bridge, and 4 to Victoria. Even with these paths it predicts a high level of standing between East Croydon and London Bridge. And their idea of a high growth scenario works out about 2.7% p.a. for LB. If this proves to be an underestimate then I do wonder if a more radical intervention in central London may be needed before 2043 (the time-frame covered by the document). I don’t think Anonmibus meant literally picking it up and turning it round like a Hornby model. Building a new chord near New England Road, with through Coastway platforms on it, and with terminating platforms where the carriage sidings are now, could be done without touching the existing listed structure. Contriving it so that BML to Coastway (East or West) through services are possible might be more of a challenge, but there are other routes already for such services. Gatwick – given that, in the current timetable there are 14 through tph @ the airport, plus the 4 special GatEx’s … does it really, really need all that capacity? Thus easing up the loadings at the W end of the Coastway, & also freeing up one or two paths from Lewes & eastwards. I know we are “getting ahead of ourselves” in this serial discussion, but …. The Sussex RUS that Briantist linked shows most of Redhill – Tonbridge to be enabled for c. 100mph running already. At present, in terms of passenger services it is only used for all station stoppers. Looking beyond, Sussex destinations this has the capacity to offer Tonbridge / Ashford / Canterbury etc OOC expresses for instance if there was sufficient capacity between Redhill and Clapham Junction and then up WLL. It suggests that one thing the BML2 group have got right is suggesting that Sussex and Kent aren’t idependent and over a generational time frame should be considered together. Every time I am at Gatwick other than late at night there tend to be a lot of passengers waiting for the next London train which tends also to be very busy. I also don’t think pax count represents an accurate measure of loading for Gatwick services as luggage is a major factor. Personally I don’t think any of the Southern / Thameslink services are redundant. The same cannot be said of the Gatwick Expresses. Diverting those to Chichester then Portsmouth or Southampton might make sense . In any scenario, I find it hard to see that improving services to Littlehampton is a priority however. The running of all south coast services via Gatwick. The extension of Brighton – London Bridge services through the Snow Hill Link. The extension of more Met services to Aldgate. All measures taken in the 1980s to make use of spare capacity to drum up trade. All now so established they are now causing of congestion but can’t be reversed without disrupting established travel patterns. I assume everybody has seen one or another newspaper reports, which show the depth of the problems we have been discussing in this series of articles? Here is a sample: The 07.29 Brighton to London Victoria train failed to deliver passengers to the capital on time on all of its 240 attempts attempts in 2014. Which definitely shows that something – several somethings actually, are not right & that serious remedial action needs to be taken. Brigton, 3 stops, Gatwick, then fast to Victoria. picked up a bit of delay at every station arriving 4.75mins late at Gatwick arriving 5.5mins late at Victoria i.e. officially late. Most of the delay is picked up before departing Gatwick and probably due to narrow end doors and time taken to load. This would probably be solved by the arrival of the 387/2s. The dwell times etc. south of Gatwick might be timed for 377s (or CIGs!) with better access/egress. Because of the dwell time problem, running 442s in the peak flow on anything other than Vic-Gatwick is probably not the best use of them, but needs must. Or does it have to “depart” Gatwick at a certain time due to the advertised every 15 minutes frequency of GatEx? Would the pathing allow it to depart Brighton earlier? The fact that no minor retiming fof this service wasn’t done for the recent timetable change may indicate that a 377 or 387 will be rostered to the service in the near future. Surely that is a Southern service – one that happens to use 442 stock and has “Express” branding on the carriages. While there used to be a separate train company called “Gatwick Express” that doesn’t exist any more – it’s now just a brand name applied to certain trains operated by Southern. The TOC for the service is listed as Gatwick Express not Southern. Gatwick Express and Southern became one and the same franchise in 2008, and will become one with TSGN in June of this year. 442s operating south of Gatwick are definitely Southern services! I know – but that’s misleading. The rail industry and dft should not be so fast and loose with terminology. Try and find the legal address and company registration number for Gatwick Express. Hint – you won’t find any. Brighton, Hassocks, Wivelsfield, Haywards Heath, Gatwick, VIC. So, there are no obvious conflicting movements or potential hold-ups either in front of or behind this train. Given previous comments on it being a “442” with consequent long dwell-times certainly suggests that something isn’t right, somewhere …..
Err .. table 186 lists the operator as “SN” = Southern. The New England Quarter shown in your link is to the east of the statoin and its approaches. Modifying Anomnibus’s suggestion to put a station on a new north-west curve from near the end of the viaduct, running across the area to the north and west of the station, currently occupied by the Network Rail depot, to join the existing West Coastway line near the New England Road bridge, would appear to be well clear of this development. Such a station could be used by trains from both the London and East Coastway directions running through to West Coastway – incidentally allowing West Coastway – London services to serve Brighton instead of running via the Cliftonville spur. Such a station would be about 300m from the existing station’s entrance, and about 100yards (half a train length) from the ends of its longest platforms. 1) Did you consider that trains via the Cliftonville spur are often full because those ‘customers’ using them don’t want to go to Brighton? 2) How much longer will a journey from, say, Hove to London take, if it goes via your new station at Brighton? 3) How much will it cost to build? 4) How many ‘customers’ will be lost because of the extra time and ensuing delays caused by this? 5) Will daily commuters from Worthing/Shoreham/Hove to London be pleased to be diverted via your new Brighton station? 6) Do you have ANY local knowledge from living there and using these serices? IMHO, this is another example of wild and extreme Crayonistaitis, and I will not comment further, even if provoked. I think you are being very harsh on some of the contributors to this blog. I make no claim to have any expertise – just a member of the travelling public keen to see improvements in our railways. An exchange of ideas helps to bring this about. Of course most suggestions will not survive rigorous analysis of costs, engineering difficulties, demand forecasts etc. – but most of us do not have the tools to undertake such analysis, and are merely putting forward ideas. Looking at my ancient “Quail” map .. Going the other way, to Barnham, we have: Portslade, Shoreham (x2), Lancing, Worthing, W Worthing, Goring, Ferring, Roundstone, Angmering, Toddington Lyminster, Ford & Yapton = 14. Looking at “Bing Aerial view”, it’s almost solidly built-up along most of this stretch, so putting in alternative crossings (bridges or tunnels) is not going to be easy or cheap. One actually wonders about a Littlehampton – Lewes coastal tramway, with closure of many of the intermediate stations actually being a cheaper solution! It was not my idea to move Brighton station: I was trying to adapt Anomnibus’s proposal to meet Briantist’s objections. Whether relocating the station is worthwhile to achieve this is of course debatable – the present layout is not ideal but is usable: and I think one of the lessons of the Thameslink project is that any major project takes a lot of years of being very much worse before you see even a small improvement. Agreed there is a market for direct BML-West Coastway services, and that skipping Brighton may still be worth while – certainly for peak commuter flows when they are full. There are polenty of other through stations with bypass lines – York, Darlington, Redhill, Westbury, Frome. But a through layout would be more flexible, for example allowing London-Brighton stoppers (or East Coastways) and Brighton – West Coastway services to be combined, with efficiencies in terminal operations. I have deleted all comments that contain the word “Steyning”. The rather acrimonious discussion was rather becoming peripheral to any relevance to London and not exactly of a high standard. If you want to squabble about such matters please do so elsewhere. There seems to be some confusion here. The airport is located on the West Bank of the River Adur. The Steyning Line ran along the East Bank. The rail route can be clearly seen on the likes of Google Earth diverging to the right from the main line about a third of a mile West of Shoreham-by-Sea Station and running Northwards. The A27, before the days of the Brighton Bypass, crossed the line at Old Shoreham at a level crossing. This resulted in BR also being responsible for the toll bridge across the river. At the rate of 6d per car it must have made quite a lot of money. A connection just for the Coastways would be more realistic, linking up East and West, without trying to create a new West Coastway to London via Brighton route. Coastway trains alone avoiding the main terminal altogether could release platforms there for main line terminators, but the proposed rather isolated through platforms to the north would be difficult, expensive and perhaps a very prominent and controversial construction, with platforms on a flyover, access stairs, lifts and walkways etc. A similar benefit might be had using a rail fly-over/dive-under on approach by either Coastway to cross the main throat but continue to use terminal platforms in the main station. That way all regular Coastway trains could be dealt with on one side of Brighton station and although reversal would be required for through operation, it wouldn’t involve crossing and conflicting with the main line flows on the level and could probably use fewer platforms overall. Coastway train length would probably be limited then to perhaps 8 cars maximum, although a strategic single track connection from the East Coastway to the main 12 car part of the terminal might remain for main line diversions via Lewes. I think this might also quality as “peripheral to any relevance to London and not exactly of a high standard” too? Fitting a flyover or diveunder in, given the proximity of the viaduct to the east,might be problematic. If the crossing were to b at grade, crossing the main approach to the existing terminus on the flat could only be avoided if the platforms used by trains approaching from the north were relocated short of this crossing. The ‘7.29 Brighton-Victoria’ story is given a two-column feature in today’s (Wednesday 14th January) Independent. The sub-heading is “Simon Calder discovers why the so-called train of shame has such a terrible track record when it comes to being punctual”. Don’t forget that the railway into Brighton was carved into the side of a hill, with the ground leveled off. Any changes anyone is considering should factor in the East Coastway and any platforms as being at the current level, with everything else altered to suit. That means terminal mainline platforms north of the through route, or the mainline diving under or over the coastway route. Frankly, for the sake of a short walk from platform 1 to platform 8 and a few minute’s connection at the current station I’m not sure it’s worth it, though I’d be lying if I said I’d not considered it a few times myself. Personally I’d be more inclined to narrow platform 3 (though probably widen it at the end! ), shuffle platforms 1&2 across a bit and build a platform 0, giving 3 dedicated West Coastway platforms with no need to worry about the mid-platform junction. You might have to punch some holes in the station wall to make any platform 0 wide enough, mind you…but I think it could be worked out given the gradient on Terminus Road. I’m keep wondering if anyone would be interested in a site for such suggestions? I keep toying with the idea of a WordPress/Wiki site where Crayonistas would be welcome. londondisconnections.com or somesuch…? Might be worth it to keep this site pure, but allow polite discussion of “unfunded” transport projects. This is a serious comment, I’ve got my AWS console open and ready. [As most readers know, there are other UK transport sites that have threads set aside for the discussion of such ideas, such as the District Dave thread “Railway Ideas, Proposals and Suggestions”. Briantist, an “unfunded” transport projects website sounds like a really good idea, although maybe something a bit more distant from LR in name terms might be good just to avoid any confusion or mistreatment by Google. We ask that commentators respect our desire for fact based discussions on this site. Think of LR as a blog or online magazine, where we try to keep article comments on-topic. Not as an online forum free-for-all. We also realise the desire for more LR articles, so do note that pieces are in the works awaiting final approval. 1. the carriages are longer than the 377s, so a ten-car train of 442 stock is the same length as a twelve-car train of 377s – but both have two doors per car: the dwell times at stations are therefore longer as there are only twenty, and not 24, doors on each side of the train. (data from Wikipedia, weights quoted are for empty stock – for a fully-loaded train the relative difference is a little greater) . No wonder it can’t keep up. (Apparently the carriage designer’s rule of thumb used to be “sixteen (passengers) to the ton, sixteen (inches seat width) to the bum”, which gives an average passenger, including luggage, a weight of 2240/16 = 140lb, ten stone, or 62.5kg. ), and a four foot wide bench seat being large enough for three. – Reigate/Tonbridge to shuttles from Purley. – Uckfield back to an off peak Oxted shuttle? – London Bridge-Caterhams diverted to West Croydon and a Purley-Caterham shuttle for the duration? – Turn back London Bridge-West Croydon via Selhurst in the depot to free up path for above diversion? – Epsom Downs run to and from West Croydon. – Sutton-West Croydon shuttles replacing the other 4tph – turning round at Epsom Downs if necessary either in service or as shunt to avoid clogging Sutton. It’s possible to dispose of two trains via Belmont! – Restore London Bridge-Mitcham-Sutton, maybe using the Wimbledon paths in the peaks, maybe extending to Dorking in the peaks? – An extra 2tph Vic-Mitcham-Sutton-Epsom? All carefully designed to avoid the major conflict at Sutton ie between the Wallington and Portsmith lines! All off the top of my head! C’est magnifique, mais ce n’est pas la Gare! Has there ever been a Battle of Sutton, GTR implies there could be an opportunity, at any rate? One has heard of the Battle of Havant (railway junction) between the LSW and LBSC. Didn’t think that suburbian aspirations could be that conflicting. What frequency of competitive/clashing trains would have to cause the issue? Surely the solution is to put the Wimbledon-Sutton trains where they should have gone in the first place – the District at Wimbledon, with a simple platform or 2 at Sutton of their own – and tell Sir James Staats Forbes’ descendants to get on with life, frequently please? Golly, there isn’t even a Bandon Halt these days, nor Portsmouth via Dorking PUL/PANs, so surely local train planning is easier not harder? The problem is that the district line from Wimbledon is a very slow service, imagine how long it would take from Sutton. It may be possible to quadruple track the line between Wimbledon and somewhere south of Earl’s Court as was the original plan, but what would the justification be? Adding the Wimbledon-Sutton line to the end of the District would need some expensive tunnelling under Wimbledon station, which would no doubt conflict or complicate CR2 construction. A simpler solution would be to add this branch to CR2, although this may be a waste of capacity, as the Wimbledon-Sutton branch is much less busy than any of the other branches beyond Wimbledon. I’d just love the whole Thameslink Wimbledon loop to be taken over by London Overground, and divorced from the rest of the Thameslink network – it now doesn’t really ‘fit’ with the rest of the future ‘regional’ TL network. COR/BUF on that route, surely? South Croydon (Purley Oaks) Toby has a picture up of “Croydon Station c1890”. I’m not sure which of the Croydon stations that is. 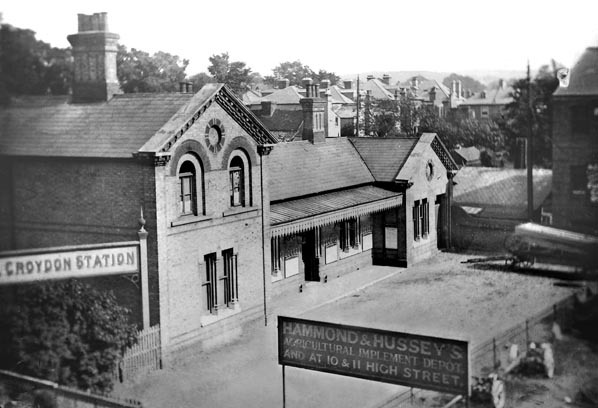 There’s also one of the now-demolished Bingham Road Station. the site of the station. (there is a commemorative plaque), and a line from there to East Croydon passes to the north of the Halls. At one time there was legend that the platform awnings still existed in the town hall cellars. A rebuild of Windmill Bridge Junction and East Croydon Station – the rebuild will possibly now include grade separation of Selhurst Jn (previous scheme criticism) for slow services south of East Croydon than run on the fasts further North. Selhurst Jn Grade separation (if not done as part of Windmill Bridge Junction, possibly instead of Coulsdon North /Stoats Nest). Hence NR not suggesting much and TfL seeing major issues needing dealing with very soon. NR really don’t want to do anything for London Bridge via Tulse Hill and this appears to be a major disagreement between NR and TfL due to growth numbers. Recent Southern (Metro and long distance) growth has been running at 7-8% p.a. but total growth 2011 to 2043 used by NR is 39% for LBG metro services and 44% for Vic metro services which are equivalent to 1.03% and 1.15% pa. So there could easily be issues by 2020 but it looks like NR want TfL to “contribute” if they believe the growth is really there (classic lower metro fares box problem resulting in lower BCR). Anything mentioning BML2, Thameslink 2, Lewes – Uckfield horsehoe etc. The Chipstead Valley really doesn’t need 12 car trains! That’s also one of the two main obstacles to 12-car on the Thameslink Elephant lines – the other is Herne Hill. May I suggest if you want all 12-car through London Bridge you send 8car Tatty Corner trains via Elephant and something else through London Bridge in their place? Not my suggestion… but NR say the extra capacity is needed along the Purley – South Croydon – East Croydon – Norwood Junction to London Bridge section not via E&C in due course. Running another 4tph peak additional 12 car service LBG to East Croydon (and beyond) as well won’t work (unless they are the reinstated former stoppers via Tulse Hill and Palace which were 2tph but they won’t be Thameslink…). On the same subject the VIC to CAT and TAT may well go from 10car to 12car as well. Or possibly in a desk on the fabled Nazi train which conveniently contains the required funding as well! The Chipstead Valley may not need 12 coaches (although 8 would be welcome in the peak -full and standing on 5 car at Reedham) but those trains are rammed beyond Purley and although you could do 6+6 or 4+8 on the Victoria trains, if they are London bridge and Thameslink they are fixed formation so no joining. For those interested in e.g. the Lewes-Uckfield aspect covered by the NR Sussex report, I suggest you download the pdf and use your pdf ‘Find’ facility, entering “Uckfield”. It is discussed quite a bit. That aspect closes with: “The conclusion is re-enforced therefore that Lewes to Uckfield adds value only when combined with a new lines scheme north of Hurst Green/Sanderstead. On the current understanding of demand growth, it is outside the timeframe of this study to determine what shape such a scheme would take, save to recognise that protection of the existing Lewes to Uckfield alignment is a sensible approach for the future.” What is not considered is how the route would generate traffic in its own right, remote from London-centric considerations. What is not considered is how the route would generate traffic in its own right, remote from London-centric considerations. And here lies one of the many misunderstandings of the Uckfield-Lewes proposal. The traffic generated to London simply by extending the line from Uckfield would be very limited indeed. The belief is that such an extension provides a link between Uckfield (quite sizeable) and Brighton (quite a major centre of employment) as well as other benefits based on an outward journey going southwards. The trouble is that this works best if the train can continue to Brighton but of course on arrival at Lewes by the only route that is realistic to reinstate it is facing the wrong way. One proposal to get the train facing the desired direction is a loop proposed by Jonathan Roberts and is included in the Railfuture report on Uckfield-Lewes. This loop is referred to as a horseshoe and was referred to – in the consultation chapter on page 61 and also on page 98. I presume comments about things “buried in a filing cabinet” above by ngh are referring to those items which get a mention in the consultation chapter but are otherwise ignored. No prizes for guessing the contents of Amber Rudd’s response. Or that of the mysteriously titled BML2 project group. And the challenge is: what station did they really mean? For Lewes-Uckfield, the report seems to concentrate throughout on the benefits of (or rather lack of) it solely as a diversionary route, which is most disappointing. But Lewes is also a relatively major destination. It is also the county town of East Sussex! Can’t see that option getting support of East Sussex County Council. Only threw that one in for good measure, PoP! There is also another traffic artery that has a mention – that from Brighton, Lewes and Uckfield to Tunbridge Wells (and thus Tonbridge) via Eridge. The pre-closure figures I have from the time of the through route shows that the main axis of travel was between Tunbridge Wells, Lewes, Brighton and Hastings, whilst certainly the greatest originating traffic at Uckfield was for Lewes and Brighton. Restoring Uckfield to Lewes, whichever way the trains face when they get there (east, west, or out to sea) will provide connections towards both Brighton and Eastbourne, which would be an improvement on what is there now. And an affordable diversionary route which involves a reversal is better than an unaffordable one which doesn’t. And … reversals are seen as a PROBLEM, when we are using multiple-units with cabs at both ends? OK, it may require careful rostering, if you want a quick turn-around, with a driver ready to step in to the “other” cab …. P.S “Direct” to Falmer is unnecessarily expensive – particularly as it misses Lewes out entirely. They mean Southampton Central as the destination. Reversal does reduce throughput, even with stepping back. The following train can’t approach the station until the previous one has cleared the junction. And up and down trains will have to cross each other’s path unless one leg uses right hand running. Also, the present layout at Lewes has separate platforms for London and Brighton – the junction is east of the station – so reversal could not take place in the platforms. As I said, not ideal, but better than nothing. Diversions would be better arranged by providing connections at Lewes. Going back to the Uckfield to Lewes study by Mott Macdonald, they felt that trains should not be turned at Lewes but beyond Lewes towards Newhaven, so I’m not sure that Uckfield to Brighton would be feasible without the horseshoe. Also it has to be said that additional traffic would come from Crowborough (and Eridge as TW Parkway) to Lewes, and this seems to me to have been understated by Mott Macdonald as I have said before. As for bypassing Lewes, I guess it is good that it is being looked at so that something can be removed from the scope and something still be delivered. But it really does not make sense. On Lewes, I’ve always thought it would be possible to move the station to be east of the junction as two island platforms, which would allow reversal. Personally I do not share this alarm. People are bound to have ideas, and if they go to the effort of writing them up elsewhere, then a brief mention here is welcome, particularly if it includes, as this one does, just enough information for readers to decide whether to read the written-up version. Of course, if the content is crayonism or blue-sky-thinking (and I haven’t read it myself) then any discussion of it should also take place elsewhere, as Stephen is good enough to indicate. @Malcolm – my concern was not with StephenC’s post in itself but the risk that it will provoke a tsunami of crayonism from third parties who cannot restrain themselves as well as Stephen. But let it pass. As this is meant to be a study in Sussex AND East Croydon, surely, that doesn’t necessarily mean that any solution has to be east of the BML? West Sussex is now feeling very neglected and I know a couple of WSCC County Councillors have had enough of what they consider to be second class status for this area’s rail service provision, especially as a secondary route already exists that does not involve moving any existing stations. (At the risk of regretting asking this) and the issue is what exactly? Is not BML2 suggesting an Uckfield – Lewes rebuild AND a spur tunnelling under Lewes towards Brighton? Assuming double tracking and electrification, even without extra paths from East Croydon to London, the Uckfields can be extended to Seaford; and a portion split off for Brighton avoiding Lewes. Stock wise, with electrification, 377s can be used, allowing more efficient working of that pool and avoiding the problems inherent in being dependent on the 171 fleet. The tricky part is the South coast end. I believe platforms are short on most stations from Brighton to Seaford. So no portion can be longer than 4 cars? Unless SDO is appropriate which gives much more flexibility. Then there are the paths. Can Lewes to Seaford accommodate another train or would a train from London kill one of the Brighton trains? And can Brighton to Lewes accommodate another train or would this kill the Brighton to Lewes “shuttle”? Not popular if the Brighton split portion cannot serve Lewes in its place due to the avoiding line or a change is now needed for Brighton every half hour. The ripples spread further also – given that Victoria would again be open to the route due to use of electric trains, could portion working be used with East Grinstead trains instead or as well. Off peak certainly – as they are rammed in the peaks. There is also the issue of likely attracting extra Brighton bound traffic rail heading from Kent and the Weald via Eridge impacting on loadings. A lot to contemplate. There’s also a power supply issue that prevents more or longer trains on the existing services between Brighton and Lewes. It can take an hour of queuing to catch a train from Falmer to Brighton after a Brighton and Hove Albion home game. And what would be the point of spending several hundred million tunnelling under the South Downs, another several hundred million reopening Uckfield to Lewes across empty fields, and yet another several hundred million electrifying / double tracking the existing Uckfield line, if, as you say, you couldn’t run a single extra train through Croydon and thus to London in the peak? Would it not be better to spend several hundred million on sorting out the problem at Croydon, then extra trains *could* run to places that have proven demand that lots of us actually use, like Crawley, Hayward’s Heath, the country’s second busiest airport, Croydon, etc. So no extra paths required – just better utilisation of the existing ones. What is the current maximum length of the Uckfield and Grinstead trains, and how well loaded are they? If more paths are needed through Croydon for the Uckfield/Lewes route , could some Grinsteads be run as a shuttle? Uckfield 8car (23m – 171 DMU) being lengthened to 10 car (23m)* this autumn and winter. *I think it is actually for the slightly longer 12x20m. If ngh is correct, it sounds like the throughput on the Oxted line paths through Croydon is already close to maximum, (12x20m/10x23m). I’ve never used a train from Gatwick Airport to London Victoria, for the excellent reason that I don’t want a longer journey via west London, however quick one leg of it is. I’m sure some people do want that, but who has the most recent published figures on journeys to and from Gatwick via London Z1 stations? What’s the point of Gatwick Express when so few trains run though Gatwick Airport without stopping? I think the ticket cost/mile is reasonably lower on Uckfield line which might encourage a bit of rail heading if passengers have to drive to a Station any way which encourages them to chose the Uckfield line to save a bit of money. With additional rolling stock (for both some 10 car peak running and running other at 8car) and lengthening on the Uckfield line it might be an ideal place to focus above average fare rises in the future??? @ngh – all the experience with pricing up peak fares is that it has a low elasticity. Pricing up the Uckfields is likely to make little difference to volumes (you’ll have noticed how NR have abandoned pricing up the peak in their current round of route studies). @Alan griffiths – nor me either;however,some people do. The modal split in favour of rail for surface access at Gatwick is very high – over 30% – with a high volume of sales to air passengers before they board. The problem is twofold: on the one hand, the air passengers do not fill the trains (and the trains carry fewer passengers than the regular services); on the other hand, the air passengers are usually encumbered with luggage which is hardly compatible with the commuter traffic. Eliminating a dedicated gatex service would probably produce something like another 2-3000 seats on BMLin the peaks. Not,of course, a long term solution but certainly one that would defer doing something for a number of years. [In the interests of good public order, I’m not prepared to commit myself here to a preferred solution, but it wouldn’t involve BML2]. @Graham H. A neat summary of the problem of Gatex. But as you have expressed it, one of the disadvantages of Gatex (the lower number of passengers per train) is at least partly a solution of another one (airline passengers’ extra luggage). If we didn’t have Gatex, we might be obliged to invent it to properly handle the luggage. (Though of course we might not invent it with the currently contracted frequency, fares deals or train lengths). Luggage on the Gatwick Airport service ?? Class 419 to the rescue !! @MikeP (419s are motor luggage vans). Nice thought, but these days one thing passengers and safety experts agree on, is that luggage should remain somewhere near its owner. Passengers because of theft worries, others because of a fear of terrorists with exploding suitcases. I wasn’t suggesting pricing passengers off / elsewhere just an easy way to raise revenue for TSGN (and in turn pay some to DfT) and easy to claim it is to pay for improvements (rolling stock and platforms lengthening). Thanks for that, but which London stations to they buy tickets to and from? For Koln this month and Toronto a year ago, we travelled from and returned to Farringdon. The change to LU there involves the least lugging about of our bags. That may continue to be the case after London Bridge work is done and before Crossrail opens. Remember when you could check in at Victoria for Gatwick? Your luggage travelled separately then. Not sure how it worked on the way back though, and Victoria certainly doesn’t have room for a secure luggage reclaim hall. ChrisMitch. From memory, coming back you just picked up your luggage at Gatwick, took it through Customs and then you were on your own. As you say, Victoria was a check-in facility, not a baggage forwarding one, so it worked the same as the check-in desk at the airport. After Victoria you didn’t see your case again until you got to your destination (usually). Well that’s the other problem Timbeau, East Grinsteads are extremely well loaded in the peaks! Off peak they tend to be run by rather overlong trains that could certainly be better utilised. Ultimately the issue is going to be how much weight is given to the diversionary worth of the route or the new traffic generated. Please be informed that, as a very special treat, the Wessex Section of the Permanent Way Institution [promotional bit snipped], will be presenting a paper, by Mr Peter Fagg of Network Rail Infrastructure Projects – Southern on the Brighton Mainline Upgrade Programme on Wednesday 7th March at the Rose and Crown pub – yes the one that LR used to frequent, back in the day. This will take place in the upstairs room from 18:00 sharp. 7th of March is a Tuesday. One thing that isn’t clear, however, is whether non-members can be admitted unless invited as a guest. Whilst I’ve attended a couple of meetings before at the Rose & Crown (that’s why I got the idea for LR meet-ups there), I don’t recall booking but it seemed OK just to turn up, although I did have a verbal invitation. The PWI home page gives no clue but there is a booking form* for next week which somebody may care to try as a non-member and then report back. There might even be a charge/donation but I doubt it for such an evening meeting. Having said that, when I last attended, it was under the former management and there was no room hire charge. I know that now there is for exclusive use of a ‘party’. That’s why LR left the place. PWI section meetings are open to all initially. Some sections advertise evening meetings in the railway press, which is obviously read by more non-members than members, as a way of attracting a larger audience. The PWI has been rejuvenated over the last few years and is no longer an ‘old boys club’. If you go to meetings regularly then you may be ‘persuaded’ to join, which is excellent value for money and enables access to a lot of very interesting archive and current material (LR authors to note) and reduced rates at conferences, which again are well organised and informative. There is no charge for section meetings. Which, unfortunately clashes with the Loco & Carriage Institution meeting, ( @ 55 Broadway ) which IIRC will have someone from HMRI giving a talk.